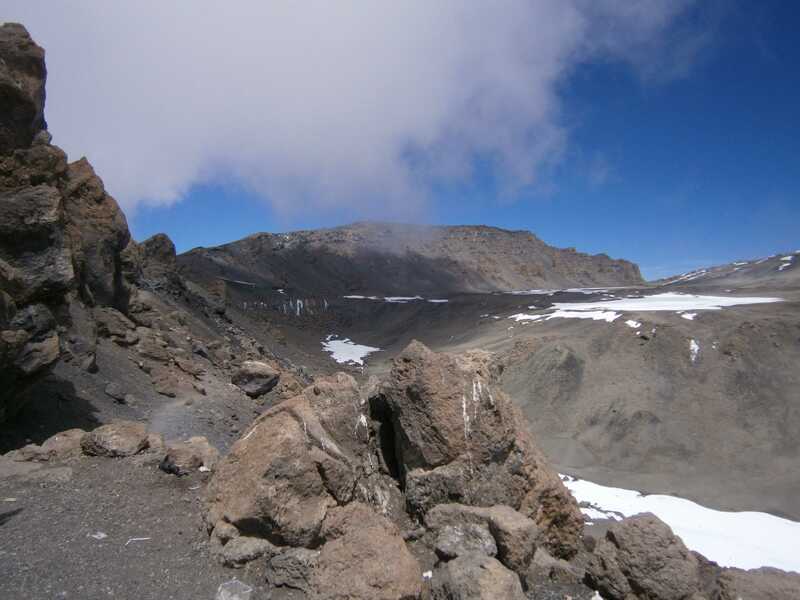 Kibo, Kilimanjaro’s central and highest volcanic peak, as seen from the Mawenzi saddle. 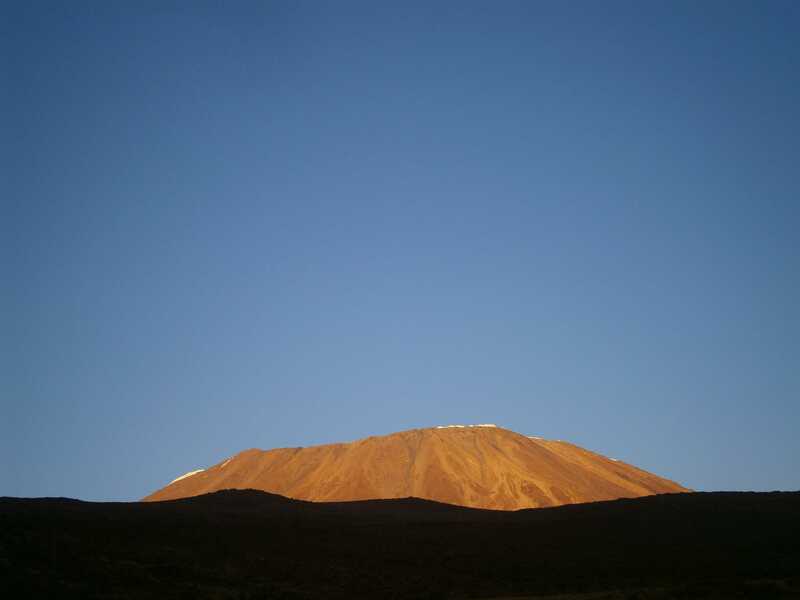 At 5895m, Kilimanjaro is the highest mountain on the continent of Africa. 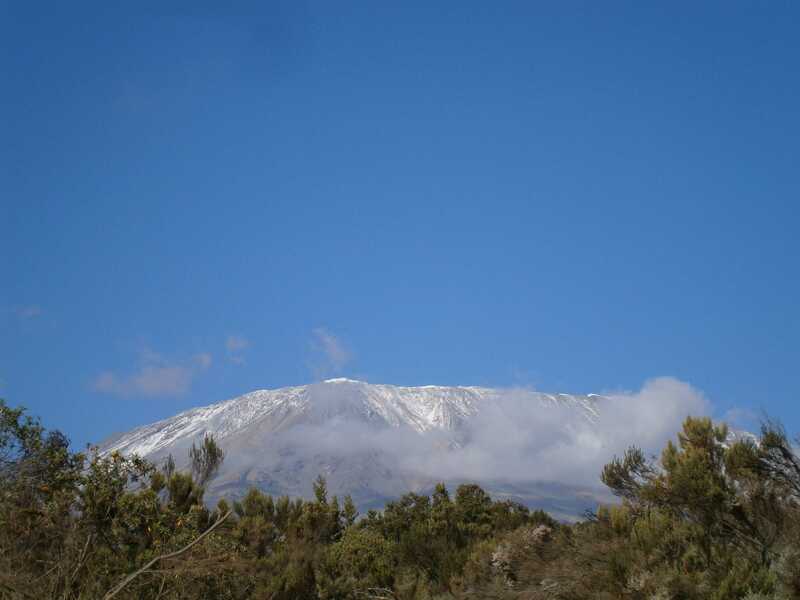 Kilimanjaro is a massive volcano which has three distinct peaks, Shira (3962m), Mawenzi (5149m), and Kibo (5895m). 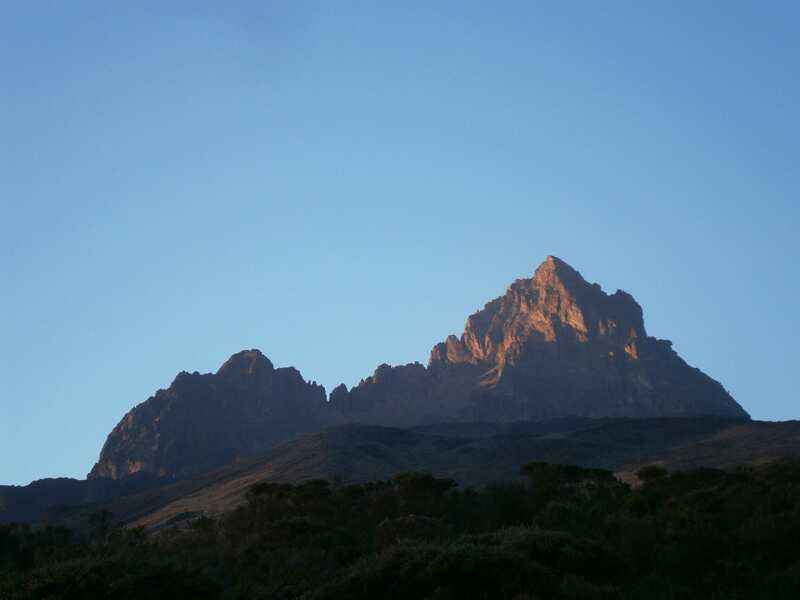 Uhuru Peak (“Freedom Peak” in Swahili) is the highest point on the mountain. 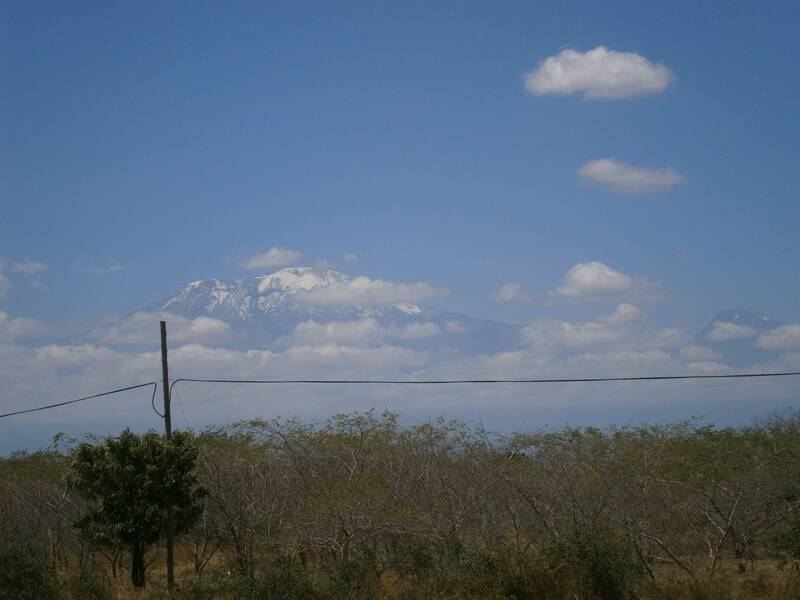 Kilimanjaro, as seen from near the airport, is remarkably prominent. 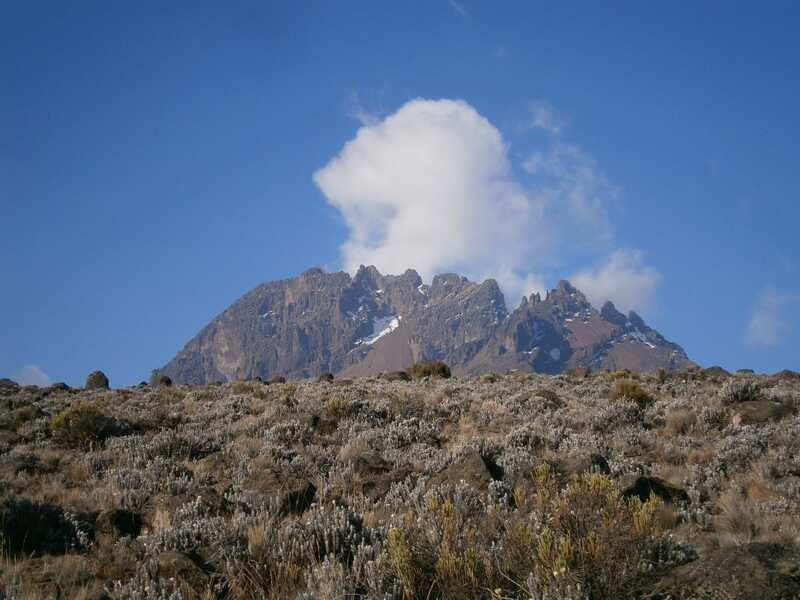 Kibo to the left, Mawenzi to the right. For some time I had been keen on broadening my hiking experience at higher altitudes, and Kilimanjaro seemed like the perfect extension of the hiking and climbing I had been doing in Taiwan. I planned a 7-day schedule, but ended up finishing in 6. 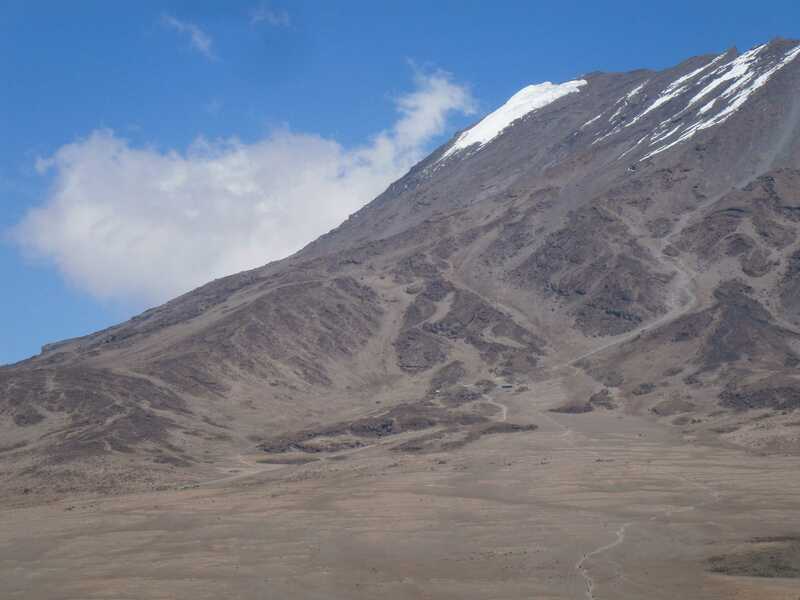 I chose the Rongai route pictured above due to its abundance of acclimatization opportunities, great views and interesting geology. 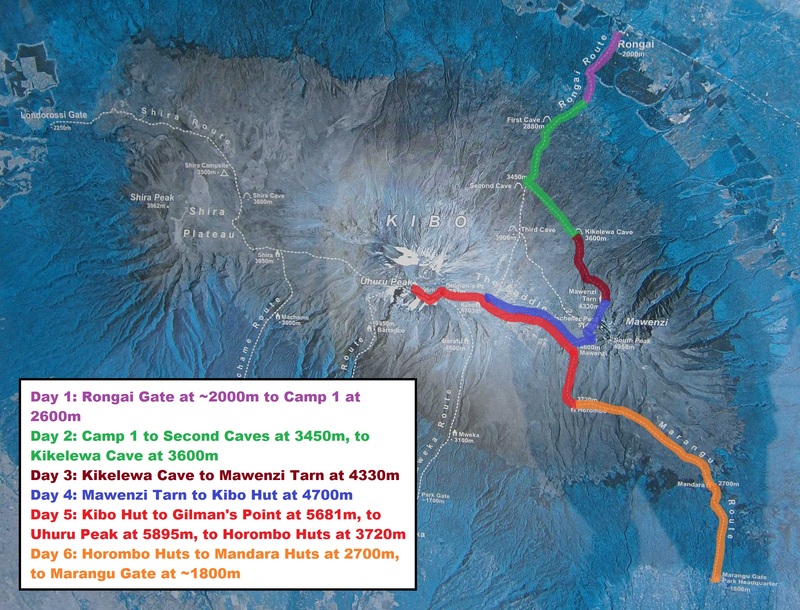 My route passed below Mawenzi, Kilimanjaro’s second highest volcanic peak. 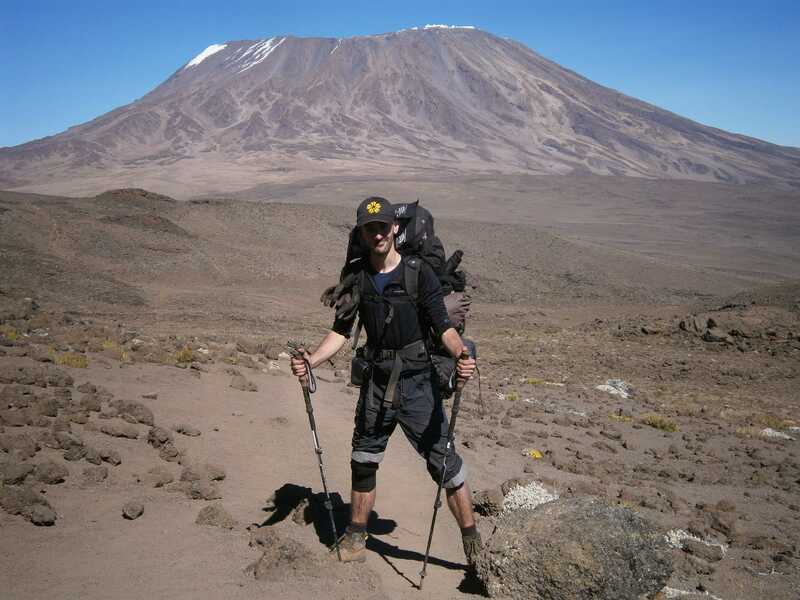 Prior to beginning Kilimanjaro I spent three days hiking 4566m Mount Meru, Tanzania’s second highest mountain, for additional acclimatization. 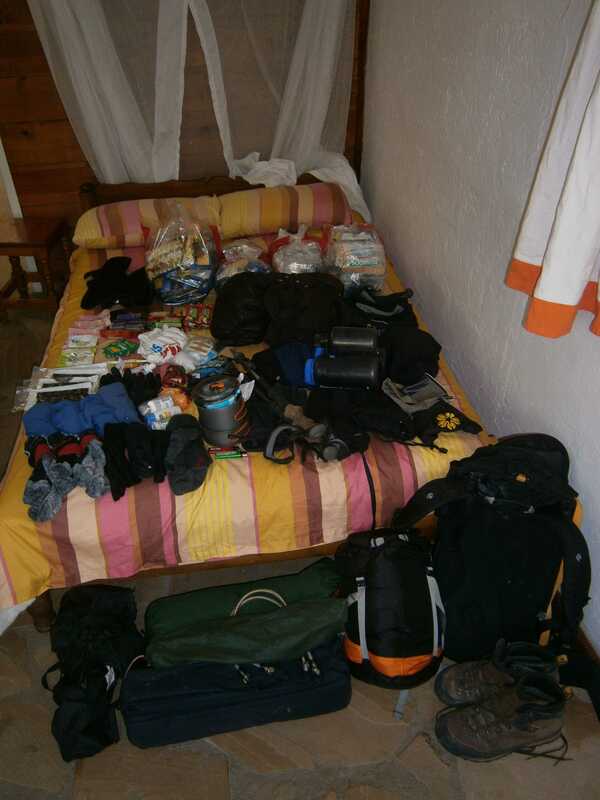 My gear and food supplies for seven days. 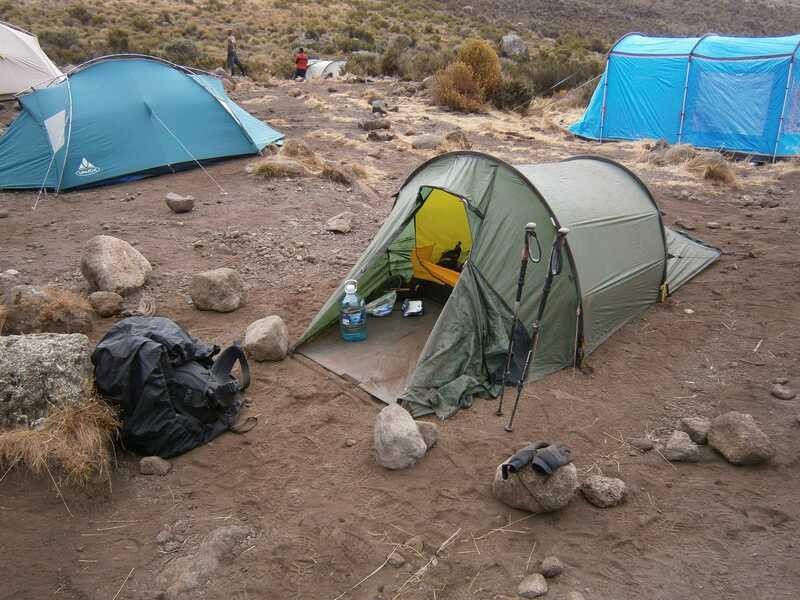 Most who approach Kilimanjaro do so with full logistical support – with porters and cooks – but this is not strictly required to access the mountain, as the law only requires the use of a licensed guide. I decided that I wanted to hike unsupported, and manage my own gear, schedule, food, and water. I would carry everything that I used, and I would provide everything for myself. This also made my hike much less expensive, since I didn’t hire porters or cooks. To obtain my permit, I did have to use a guide. My guide Jackson was not only great company, but also possessed in-depth knowledge regarding the mountain’s endemic species, and the mountain’s history. 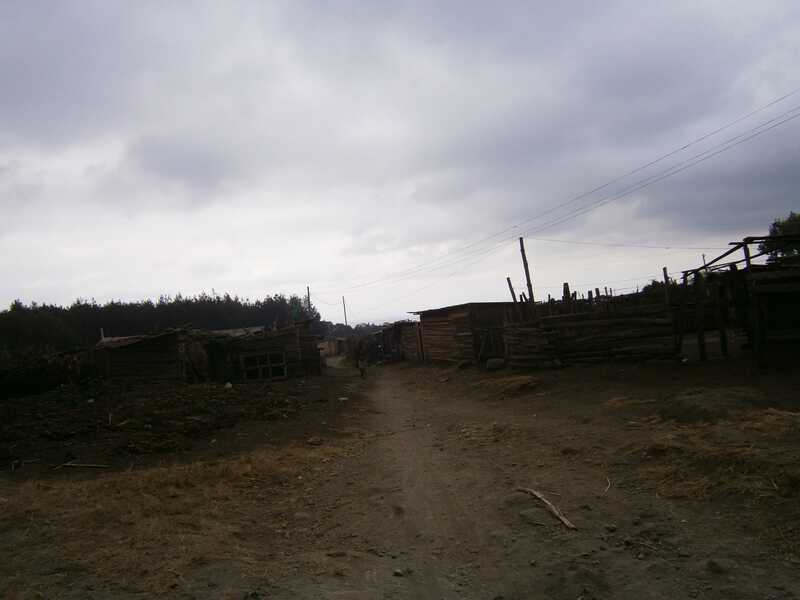 The last village on the way to the Rongai Gate, near Tanzania’s border with Kenya. Day 1: Met my guide and our driver in Arusha, and drove ~5 hours north to the Rongai gate. 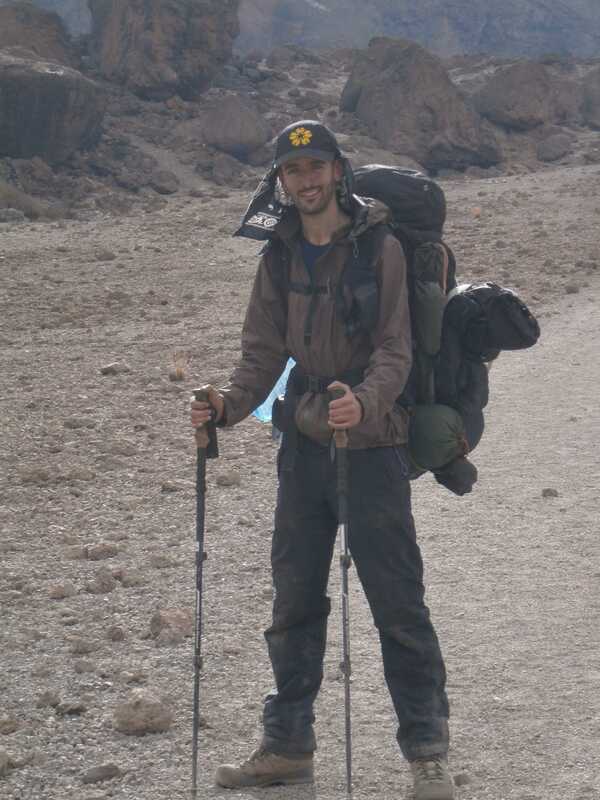 Started hiking from the Rongai gate, 2000m, with my pack weighing in at 21.5kg without water. Near the Rongai gate seasonal farming communities grow maize corn. 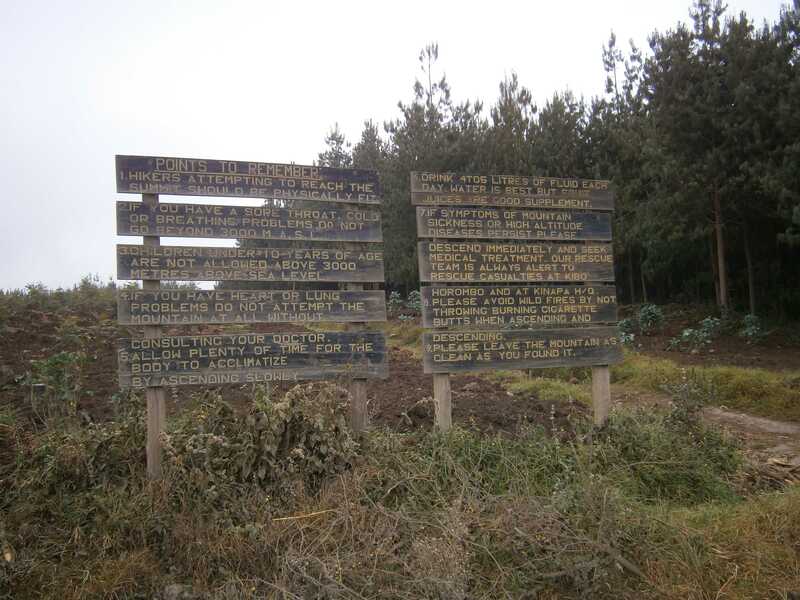 The Rongai trailhead, marked by a list of warnings. The area’s maize corn had mostly been harvested. Of interest, the corn is grown alongside trees, to be harvested once mature, several of which can be seen here. 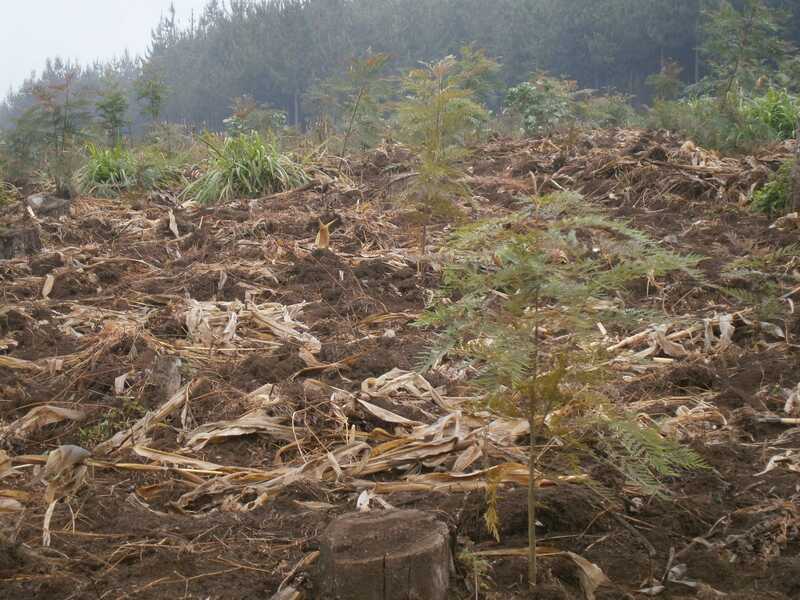 The farmers are permitted to grow corn in this area only so long as they also take responsibility for the trees. 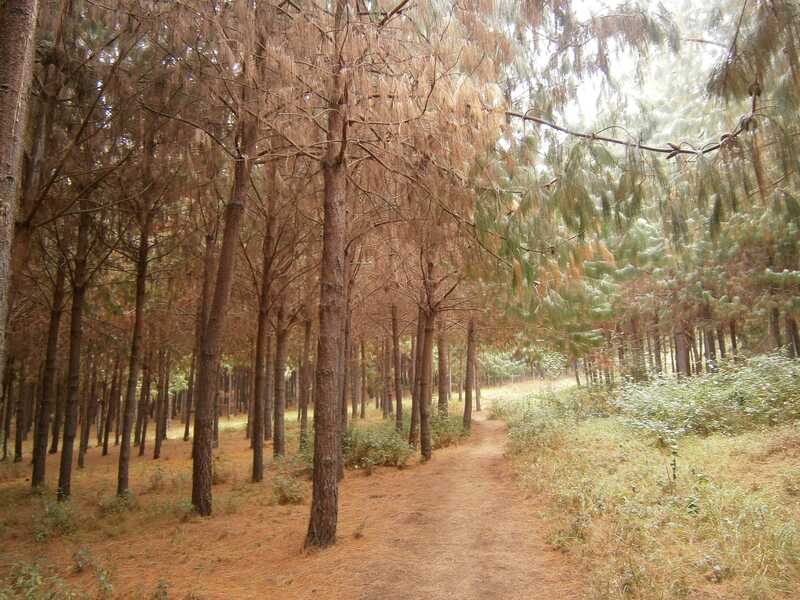 Man-made forest near the Rongai gate. I was told that these trees will be harvested for producing paper and lumber. 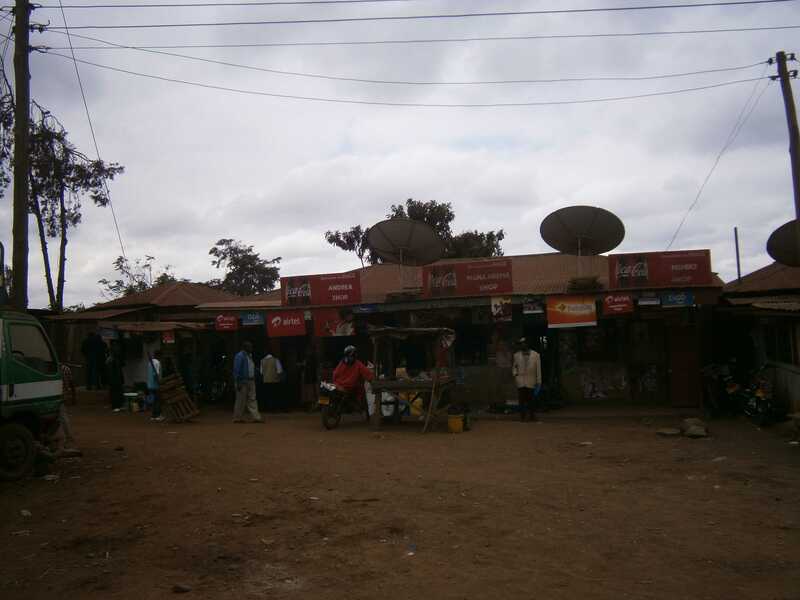 A small stop past the Rongai gate – some people from the farming community have set up a small shop selling fruit, drinks, and snack foods. Further along, rough volcanic rock became visible, though the terrain remained gently sloped. Near the first campsite I took a short detour to a nearby stream for cooking water. I collected water at camp each evening, and restricted myself to carrying just ~2.5L for use during the day. 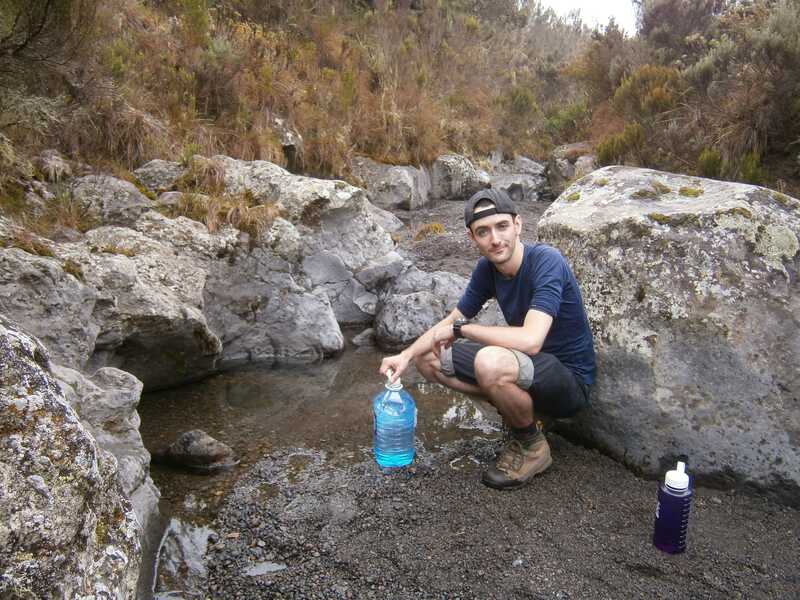 For effective acclimatization, it is imperative that one stay well hydrated – in addition to my day-supply of drinking water, I consumed an additional ~4L per day. The first water source, a small runoff stream a ~5 minute walk off of the trail. After covering roughly 6.5km, I reached the first campsite at 2600m. The campsite was large, but surprisingly crowded. My campsite on Day 1. I found a nice, quiet corner for my tent. Many others camped nearby; here are the tents of a large group. To make the weight manageable, my meal planning involved using a lot of freeze-dried food, mixing pre-made meal packs with freeze dried vegetables and rice. First night’s dinner. Looks terrible, tasted great! 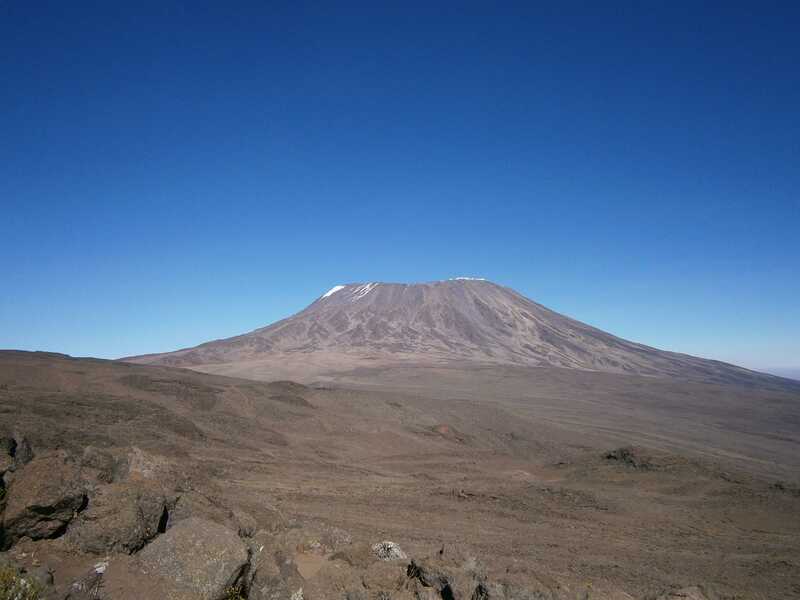 Day 2: In the morning the sky was clear and bright, and I enjoyed some excellent views of Kibo in the distance. The day started slowly, due to problems with my stove. 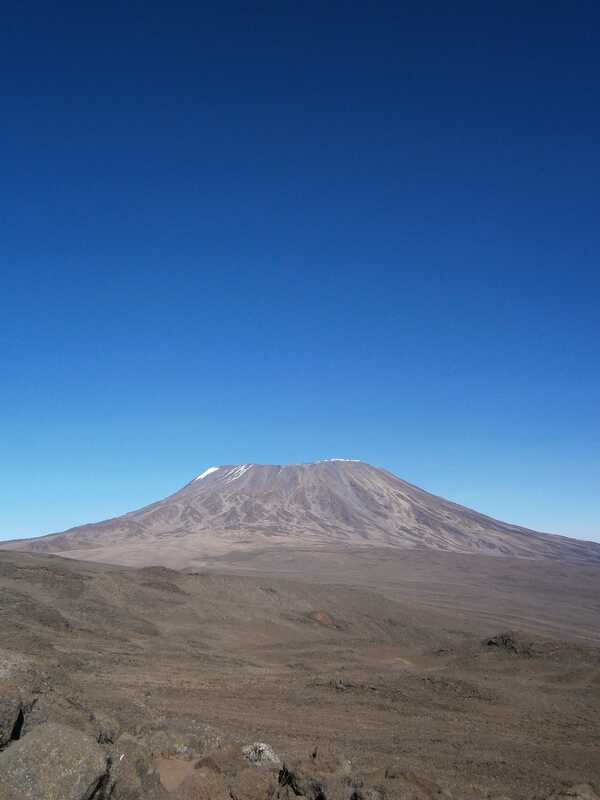 On the morning of the second day I had my first good view of Kibo. 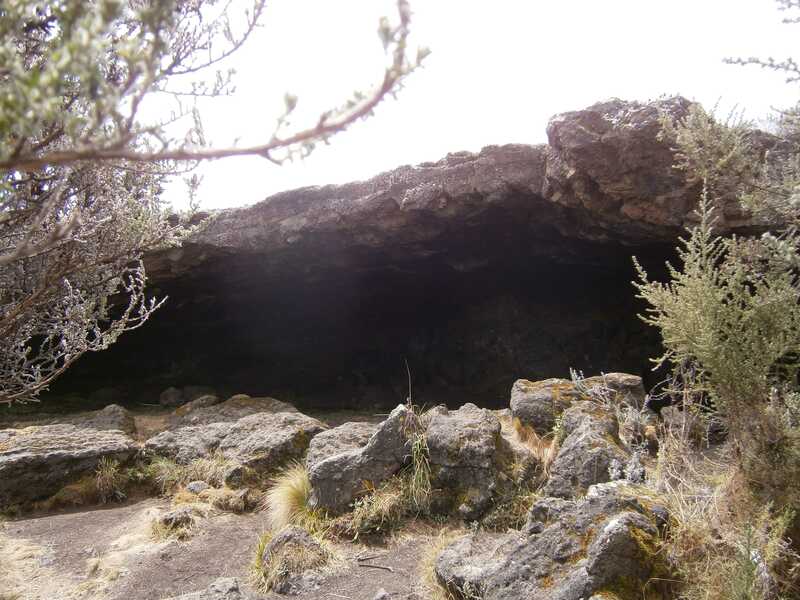 After 5.8km of hiking, I reached the day’s lunch stop, a volcanic cave named “Second Cave” at 3450m which provided great shelter for cooking. 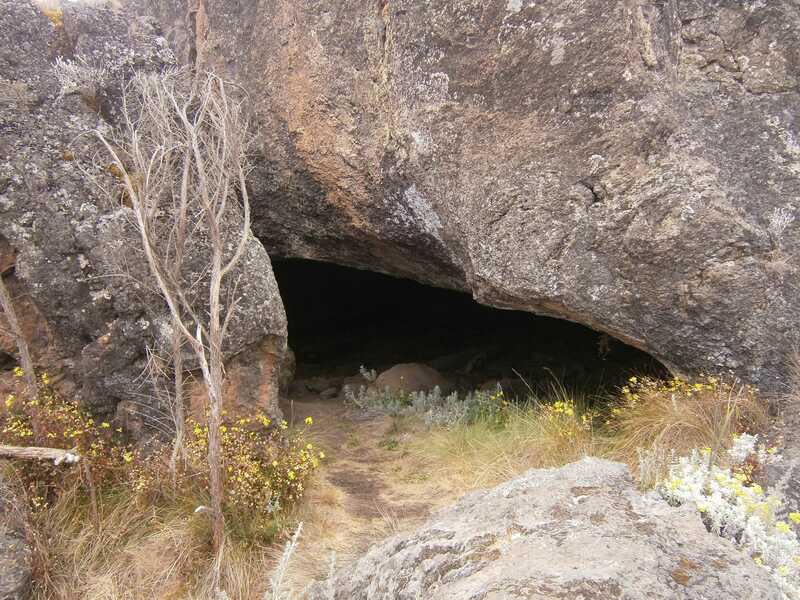 This cave, “Second Cave” provided a nice shelter for cooking lunch. The porters of a large group quickly deployed tables and chairs and began cooking for their clients. 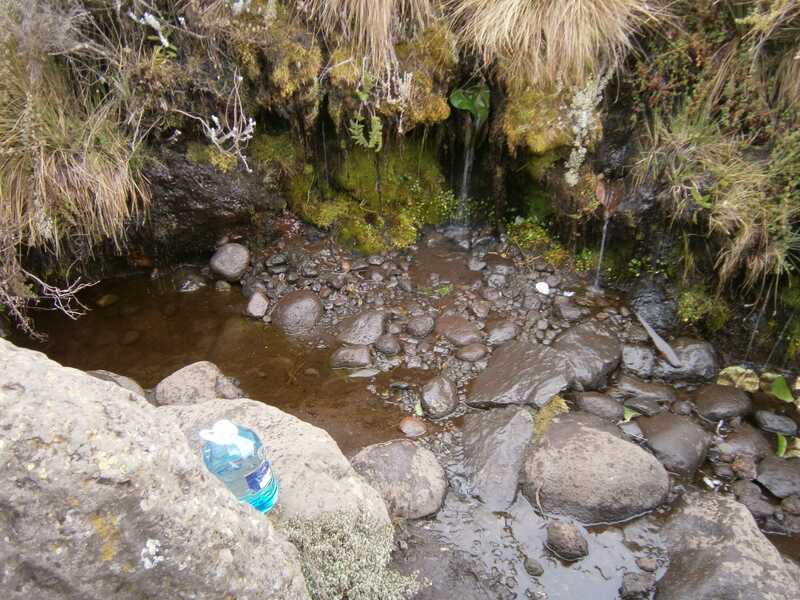 A stagnant water source nearby the lunch stop. From here on, water needed to be filtered carefully. While cooking lunch, my stove continued to cause issues. The thing was temperamental throughout the hike; sometimes it worked fine, but far too often it leaked gas at the joints, flared up suddenly, or stuttered the gas flow. Fuel cells cannot be transported by air, and I was unable to transport a liquid fuel stove/bottles, so I needed to buy both a stove and cooking fuel in Tanzania. 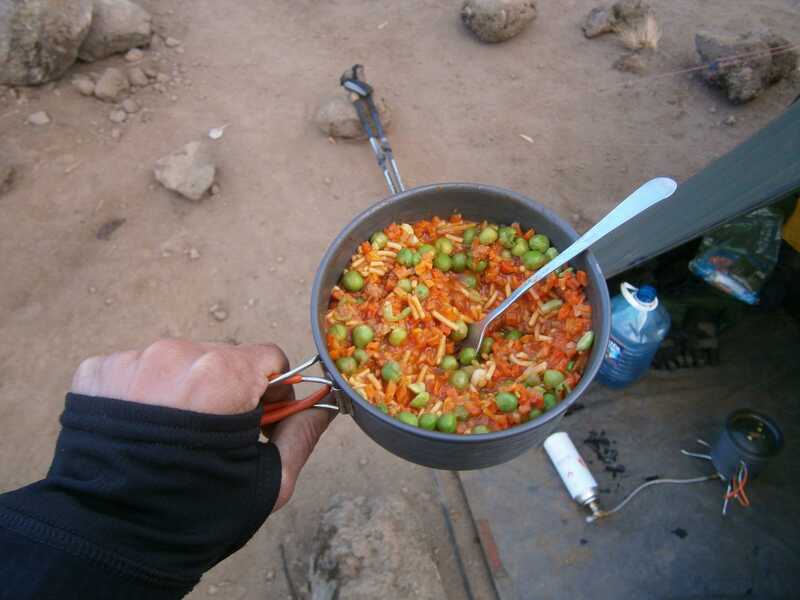 Because most hikers use porters, who haul enormous and heavy Kerosine cooking rigs up the mountain, sourcing appropriate fuel and a stove in town was remarkably difficult. Most stores only sold pierce-able gas canisters, which incorporated no valve and could not be resealed once opened. I finally ended up with a good Propane/Butane fuel mix, but could only find a really dodgy stove which required an adapter to fit the non-standard threaded gas cartridges. Cooking lunch, keeping a close eye on stove. 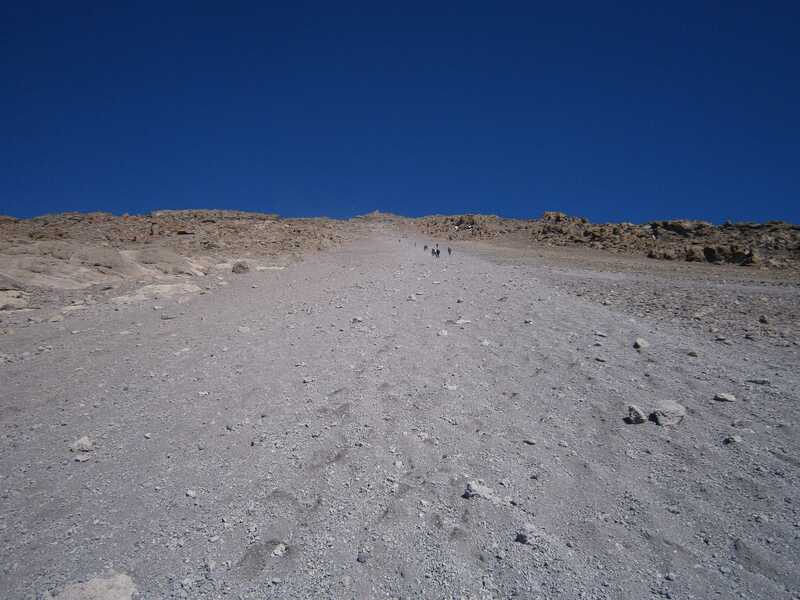 After lunch, continuing onwards the terrain remained gently sloped and easy to navigate. Past the Second Cave I crossed a large barren area which had suffered a forest fire. Halfway to the second day’s campsite, Jackson suggested we stop to explore another cave nearby. He told me that this one had only been discovered some years ago, and wasn’t too well known yet. Jackson proposed a short detour to explore another cave. The cave entrance was difficult to spot, even from a short distance away. 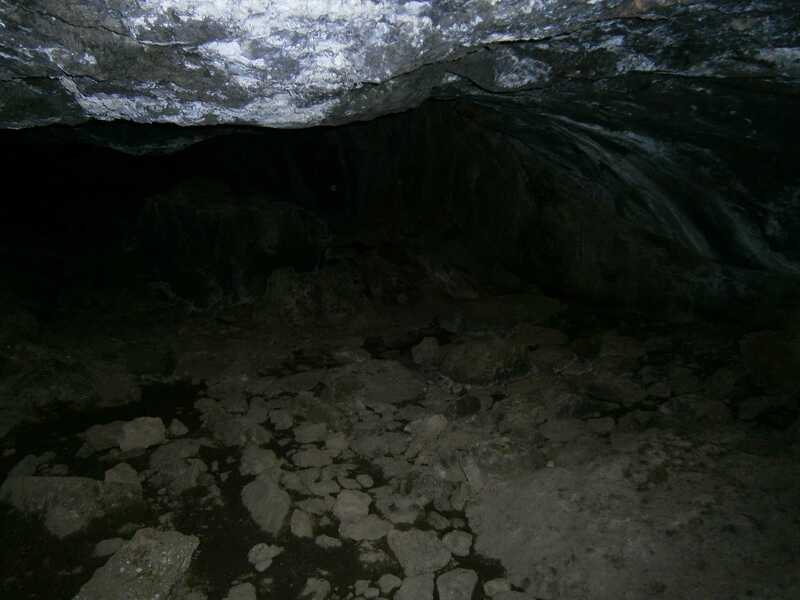 This cave was formed by volcanic activity; hardened volcanic rock forms the ceiling, and long-term erosion from rainfall and runoff has hollowed out the ground underneath it. 6km beyond the lunch stop at Second Cave I reached my second day’s campsite, Kikelewa Cave at 3600m. 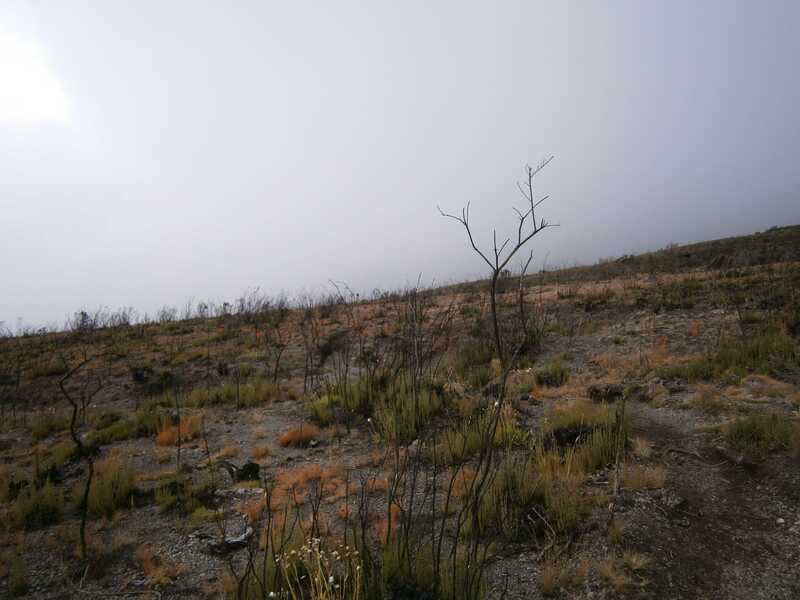 The sky was overcast, and a thin fog covered the mountain, preventing any views. 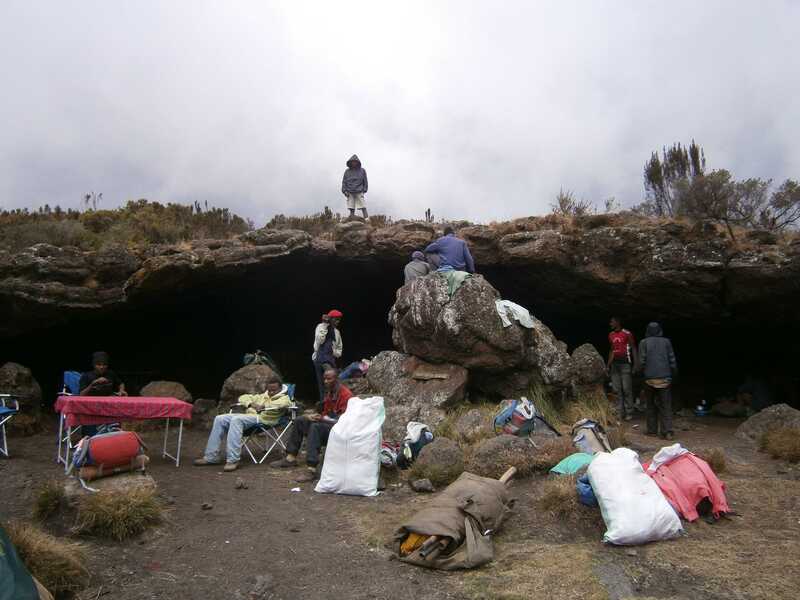 Looking up at Kikelewa Cave, my second campsite. 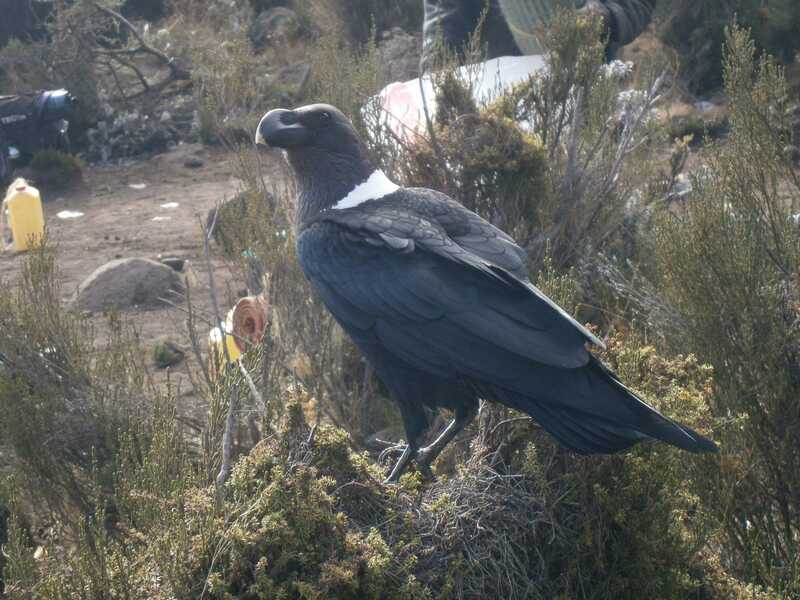 Large ravens such as this one combed the campsites for scraps. My water source, a runoff stream conveniently close by. 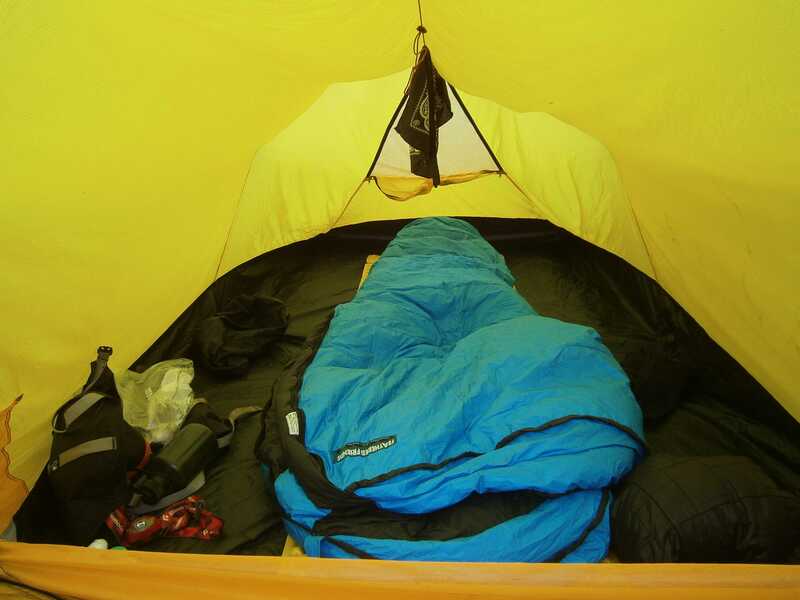 Inside my little tent – very comfortable for one person! 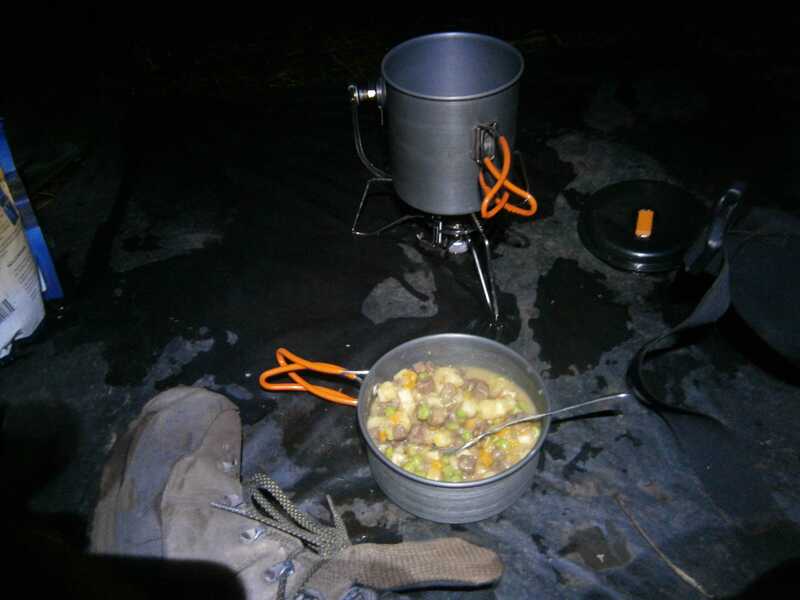 My second dinner on the mountain; cooking, eating and drinking occupied a lot of my time at camp. As the sun set, the fog cleared, and Mawenzi appeared in the distance. 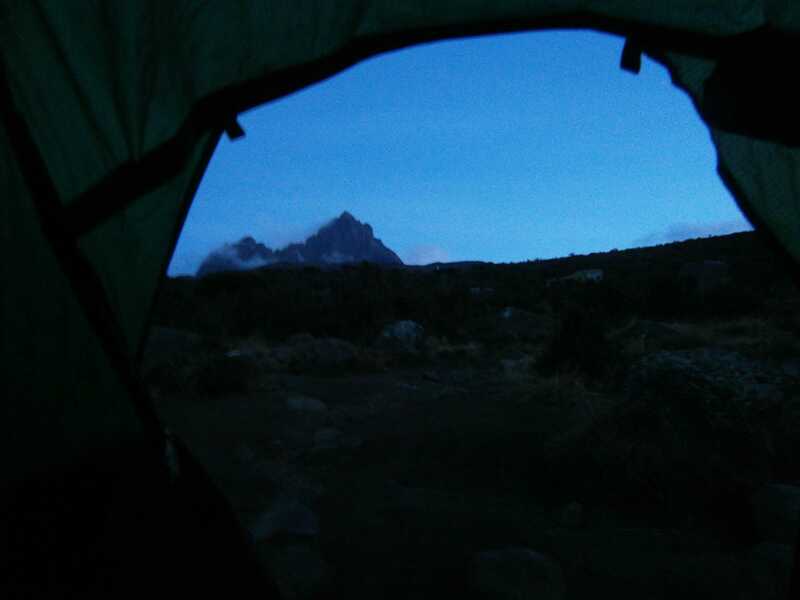 At night the temperature plummeted, and unnecessary forays outside the tent became unpleasant, so I enjoyed the view from the warmth of my sleeping bag. Mawenzi at dusk, distant, but right outside my front door. Day 3: The morning air was clear and fresh. 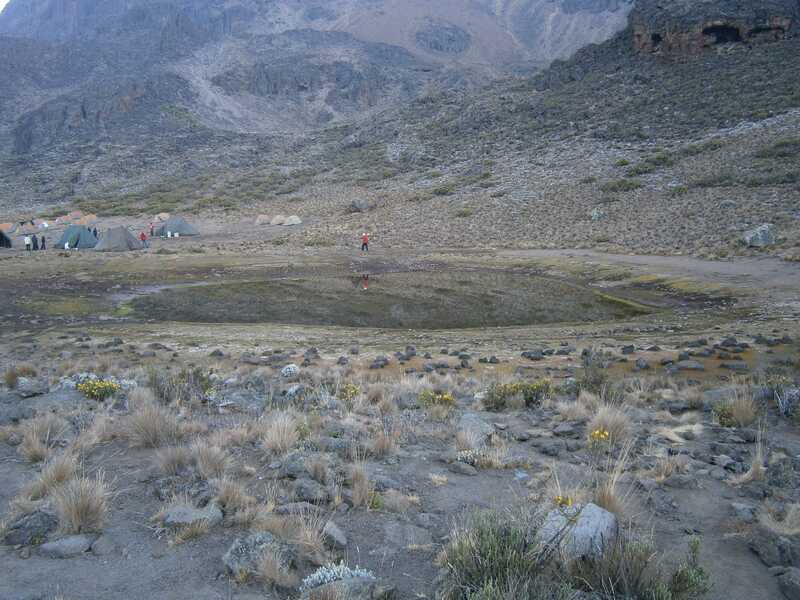 This day’s destination would be the Mawenzi tarn, a small mountain lake at the base of Kilimanjaro’s Mawenzi peak. 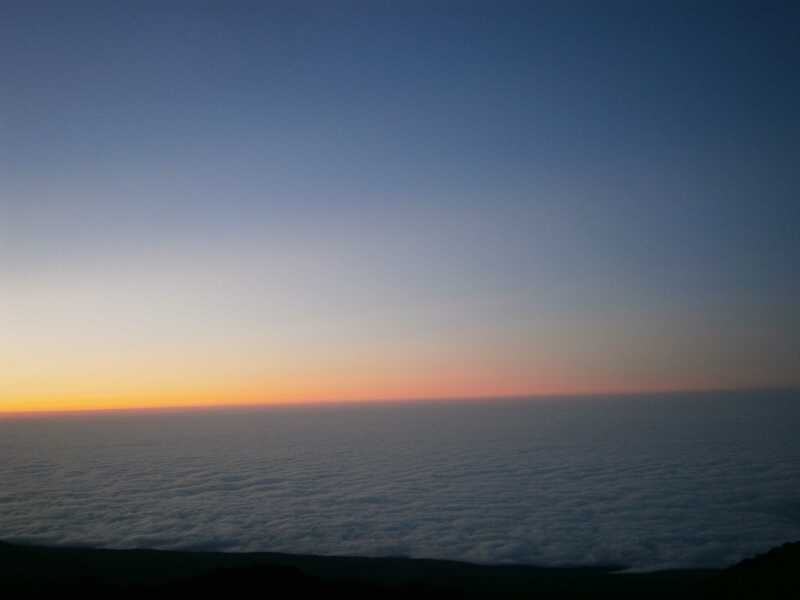 In clear air, Kibo and Mawenzi were visible on the horizon. Kibo rose out of the horizon. It is massive, very impressive to see in the distance. 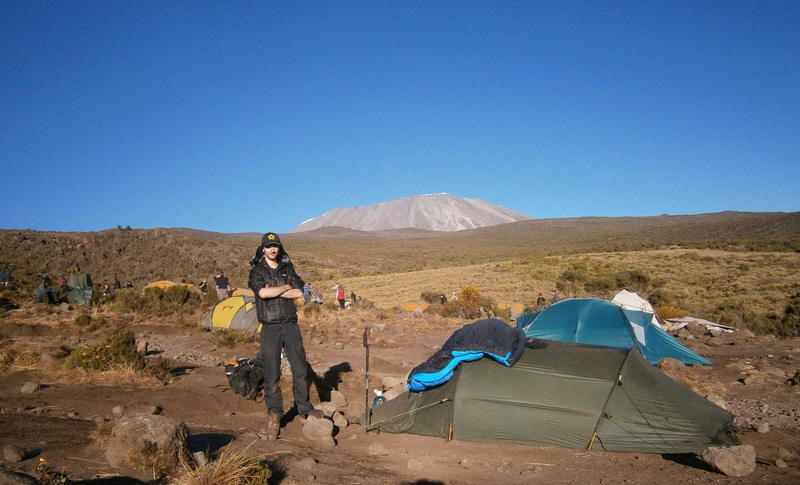 Getting ready to break camp down, enjoying the morning sunshine and the views of Kibo in the distance. 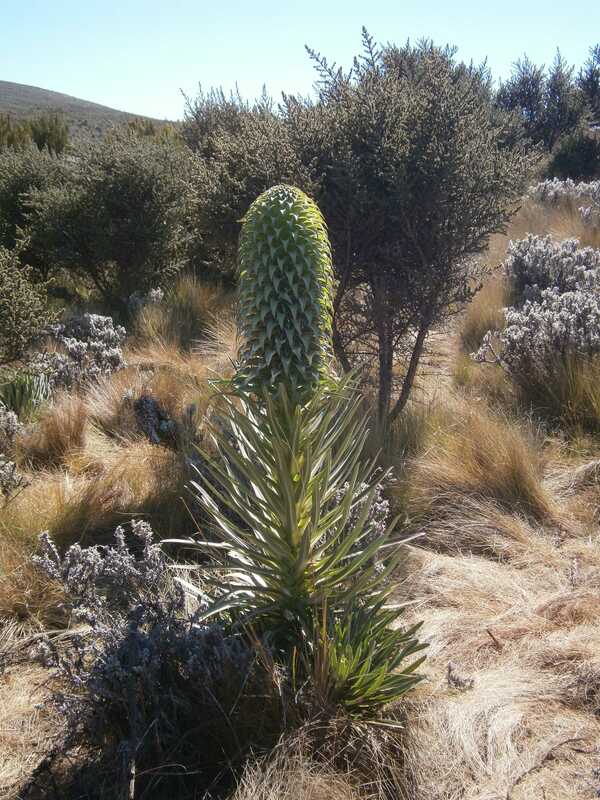 An interesting plant, growing in dense patches on the lower mountain. 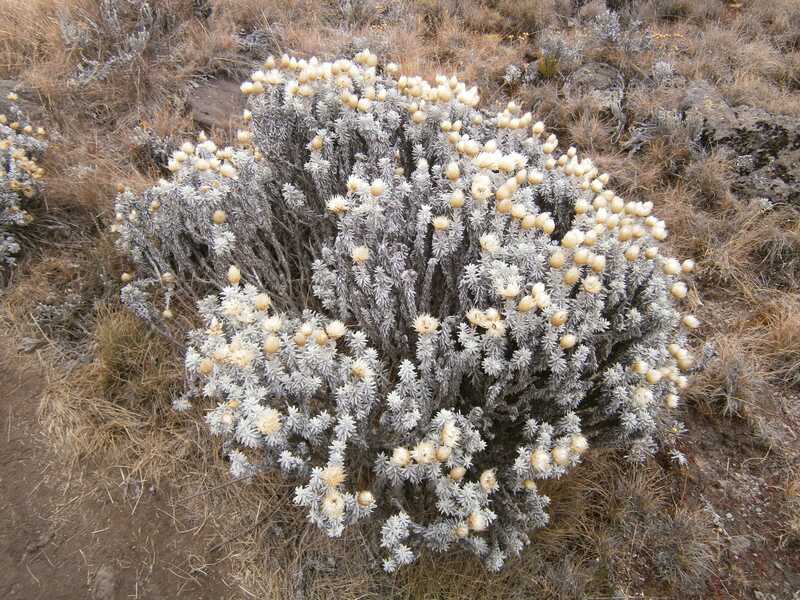 These plants grew all over the mountain at this elevation, creating the appearance of snow. 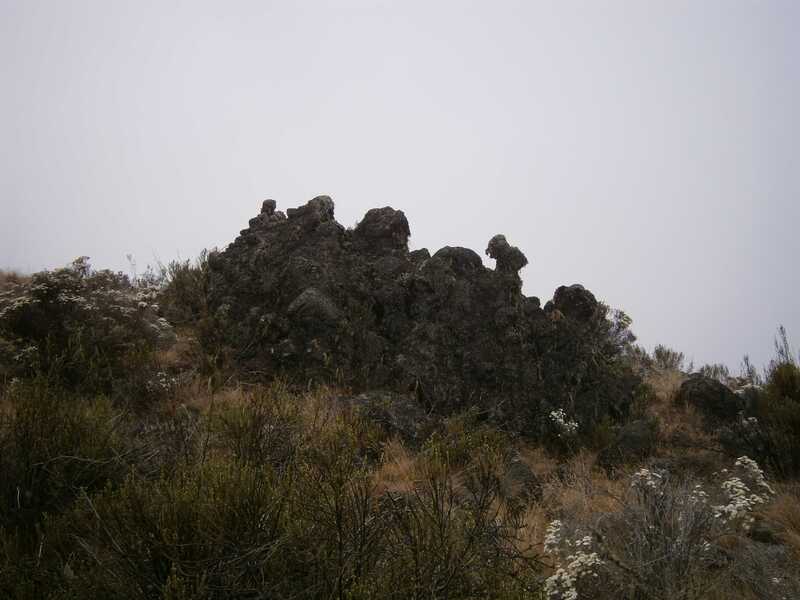 As I got closer to Mawenzi, interesting volcanic rock formations dotted the terrain. Throughout the hike I often shared campsites and trail-space with large groups such as this one. 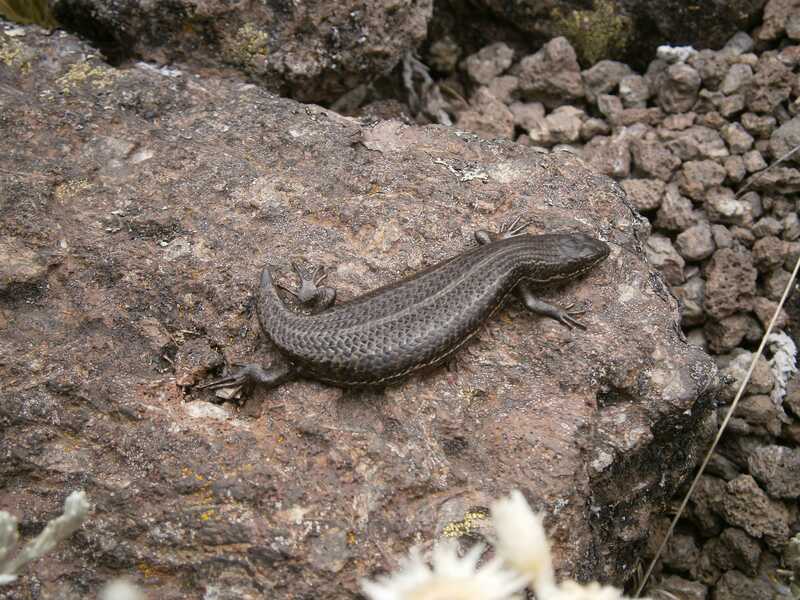 Around ~4200m I spotted this lizard just off of the trail. It looked cold! 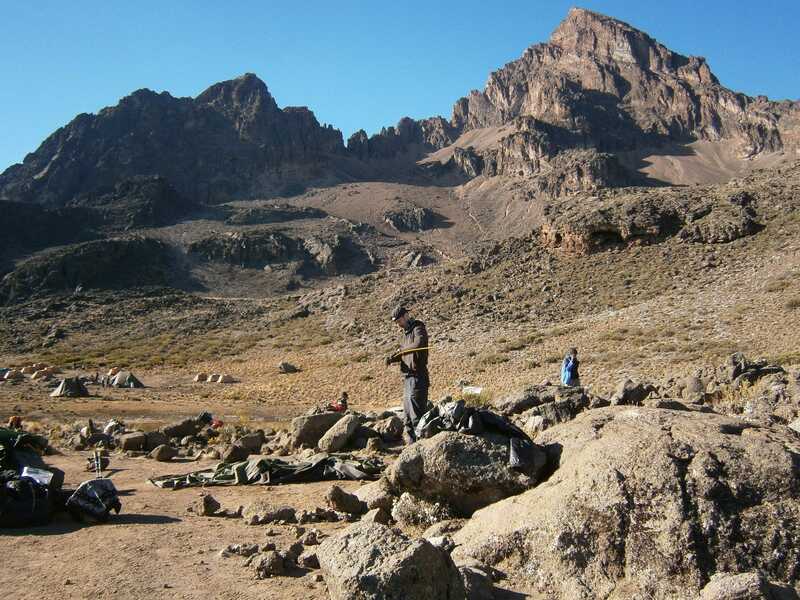 After a short ~2 hours of hiking, covering 3.7km, I arrived at the Mawenzi Tarn campsite at 4330m. The porters of several large groups had arrived before me, and so when I came into the campground it was fairly crowded with tents. Thick fog hung over camp, for the most part socking everything in and obscuring views. 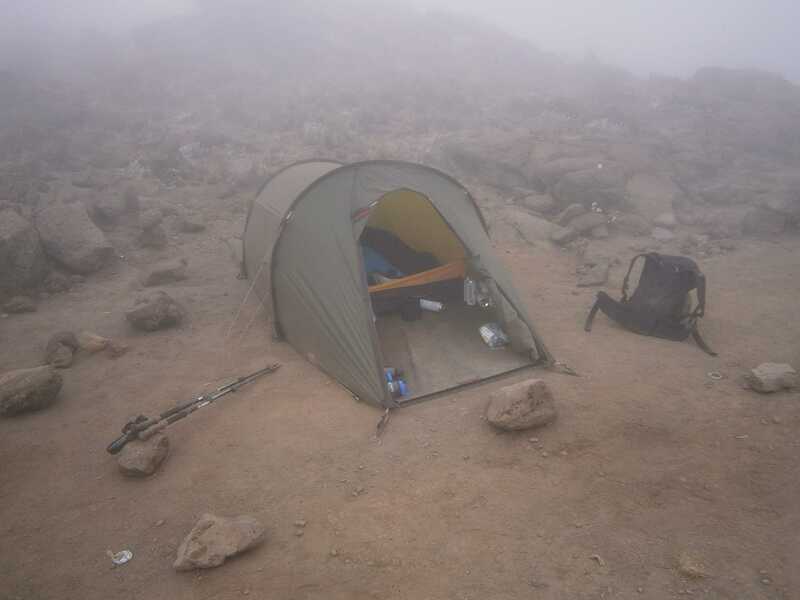 Pitching my tent in the fog. 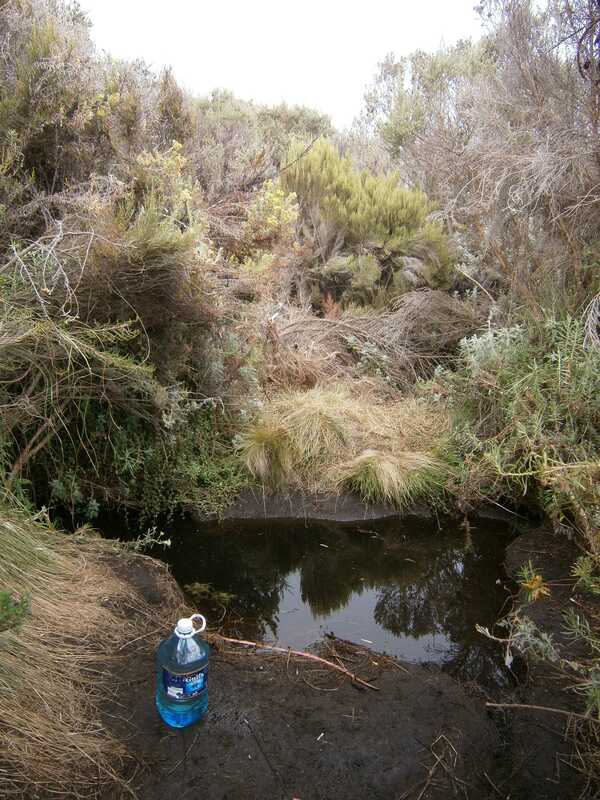 The Mawenzi tarn, a mountain lake at the base of the Mawenzi volcano, served as a very convenient water source. Overnight, it froze over completely. 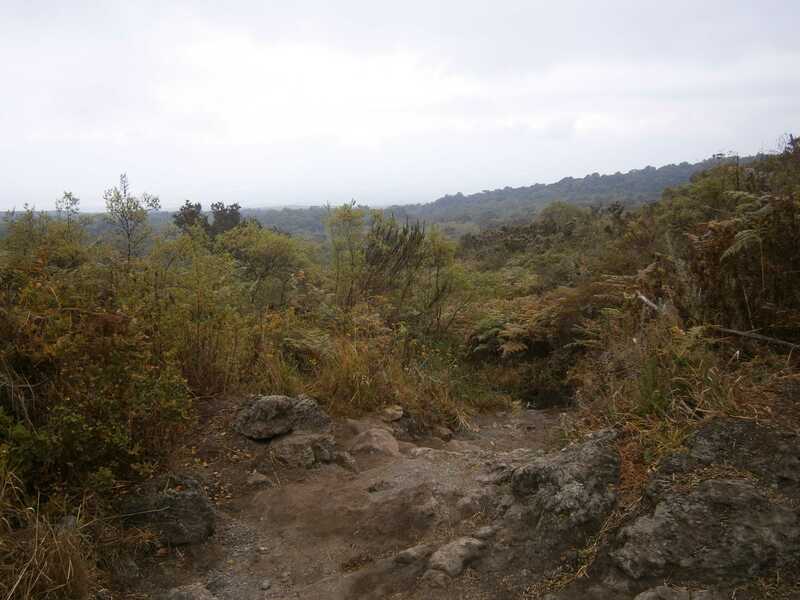 After pitching camp and preparing drinking water, I went for an acclimatization hike towards Mawenzi. I climbed roughly ~400m above my campsite, and rested for half an hour before descending to cook dinner and sleep. 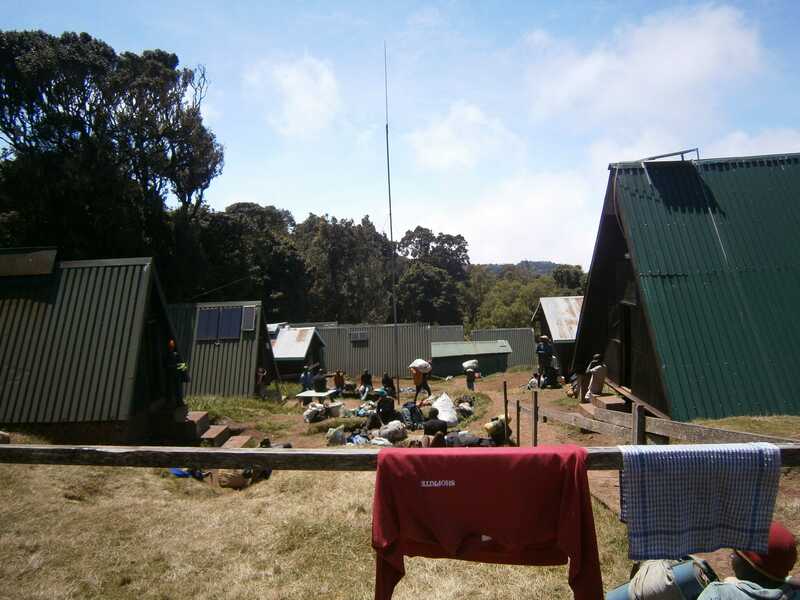 The campsite, as seen from partway up Mawenzi. Fog obscured views higher up. 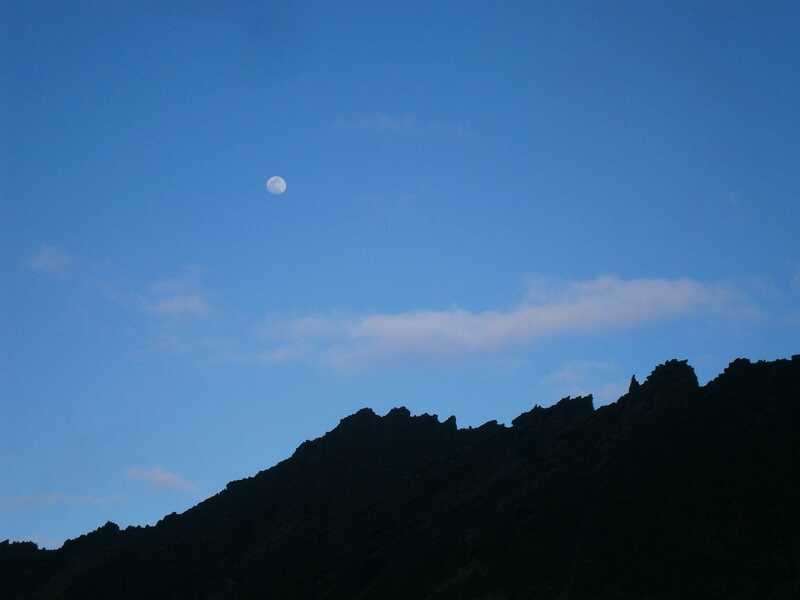 A nearly full moon appeared at dusk. Third night’s dinner – spaghetti, peas, and corn! Day 4: The morning came with a bright sunrise, unveiling a clear blue sky. Mawenzi was stunning in the morning light. The ground here was very dry, and gritty dirt began to cover my gear. From here on, everything remained very grimy. Breaking camp, taking my time in the sunshine. 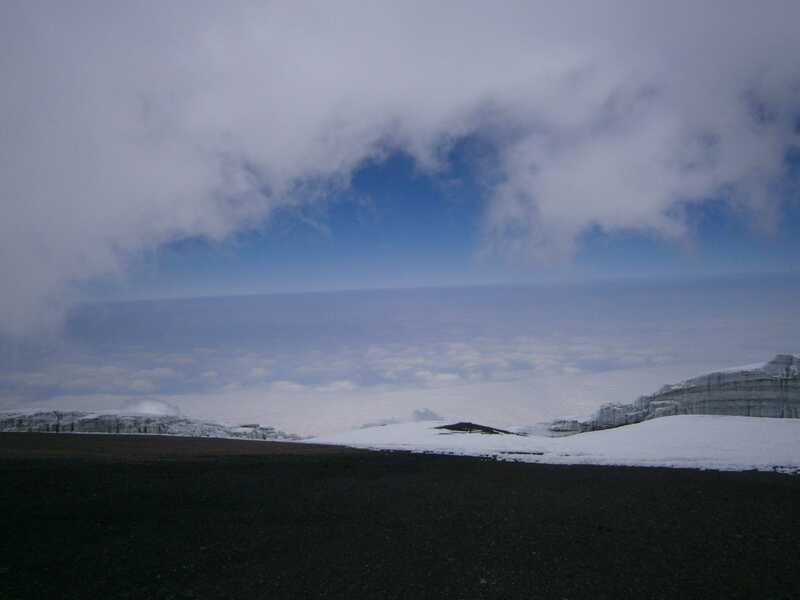 With the fog gone, the cloud ocean was visible far below. 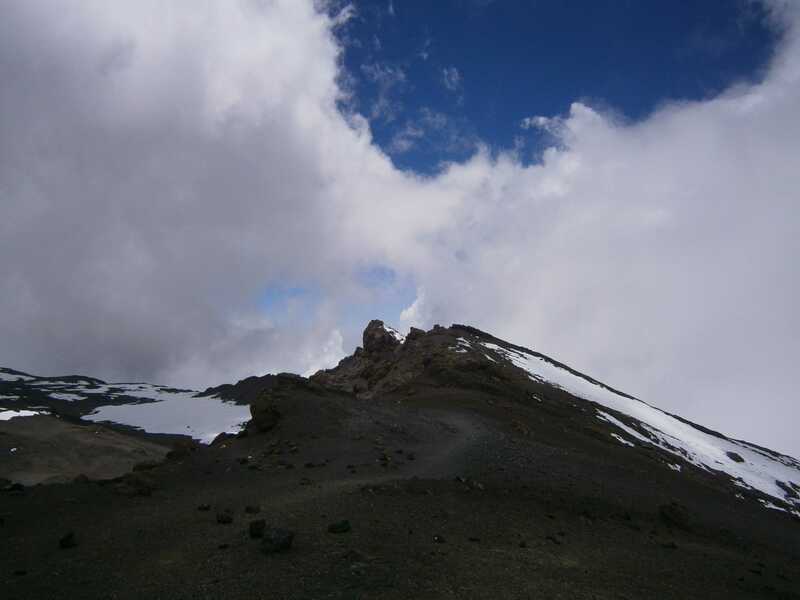 I decided to head towards my high camp today, and so set off towards Kibo Hut, located across the Mawenzi saddle. Kibo Hut is located in dry alpine desert and has no stable water source, so I had to carry the next day’s water supply up with me. Hauling the extra 7.5L of water made this a slow and difficult morning for me. 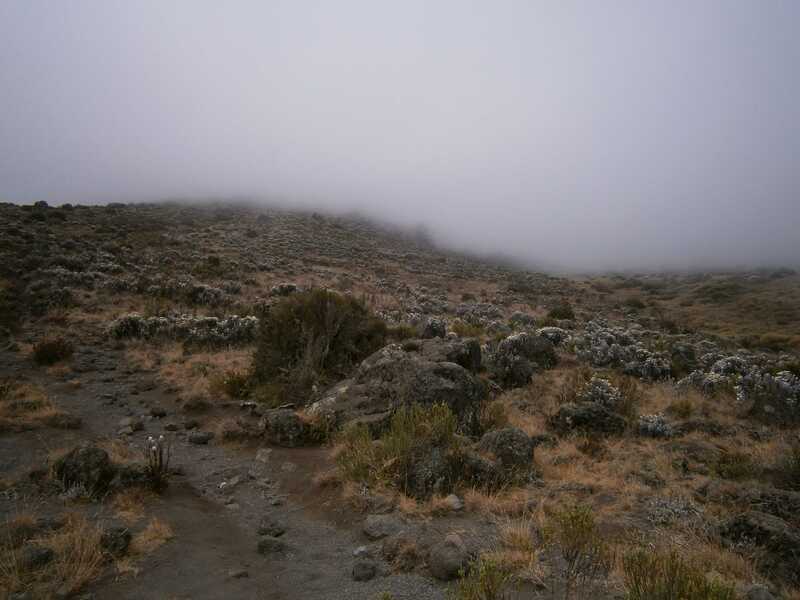 Despite this, I enjoyed perfect weather and amazing views of Kibo and Mawenzi as I crossed the saddle. Looking back at Mawenzi, from the saddle. Loaded up with water and gear, crossing the saddle. 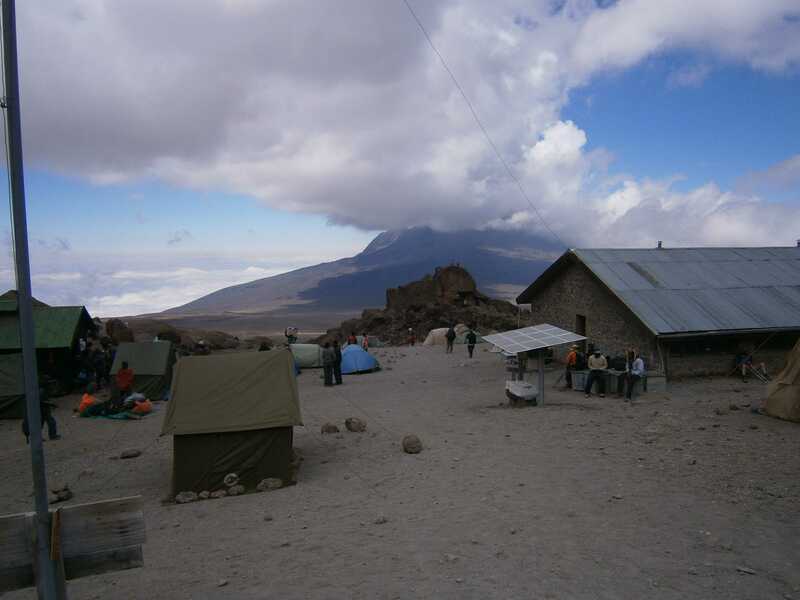 Kibo hut, my fourth campsite, far in the distance. Crossing the saddle was demoralizing not only because my pack was burdened with extra water supplies, but also because the distances were visually deceptive. 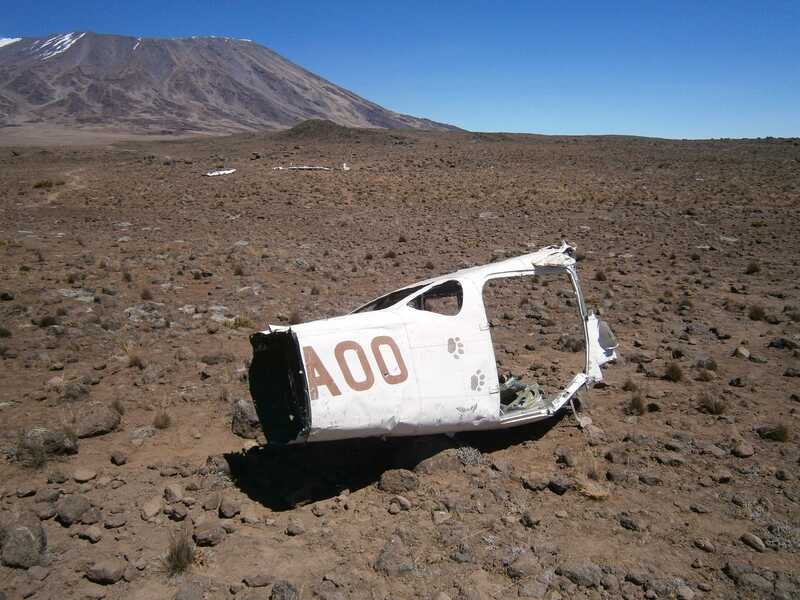 This plane wreckage, still scattered across the saddle, is left over from a 2008 crash. 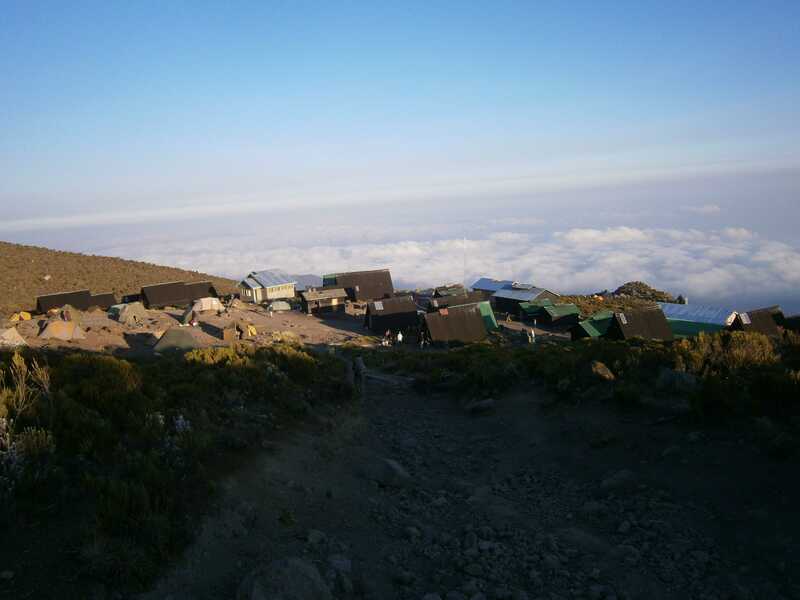 I was nothing if not relieved when I finally arrived at Kibo Hut, 4700m. 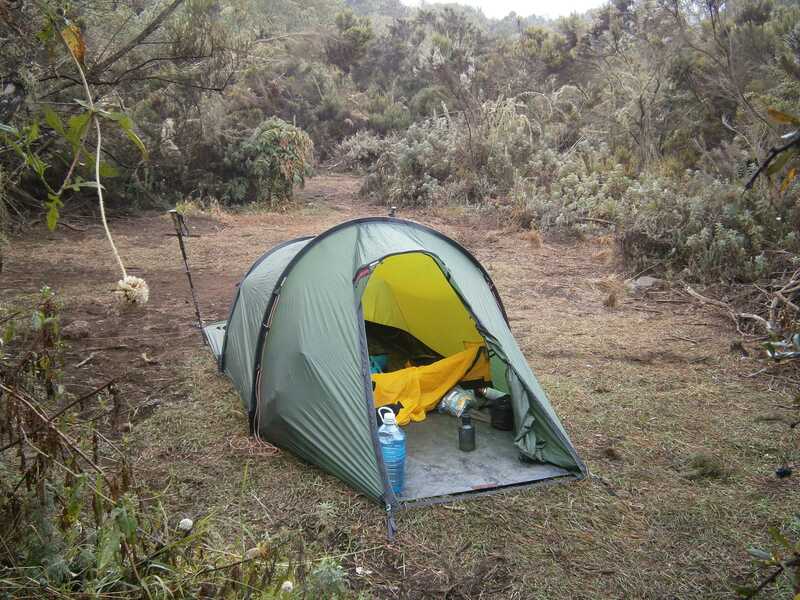 My fourth night’s campsite at Kibo hut. I was feeling strong, and so decided to head up to the summit the next morning. 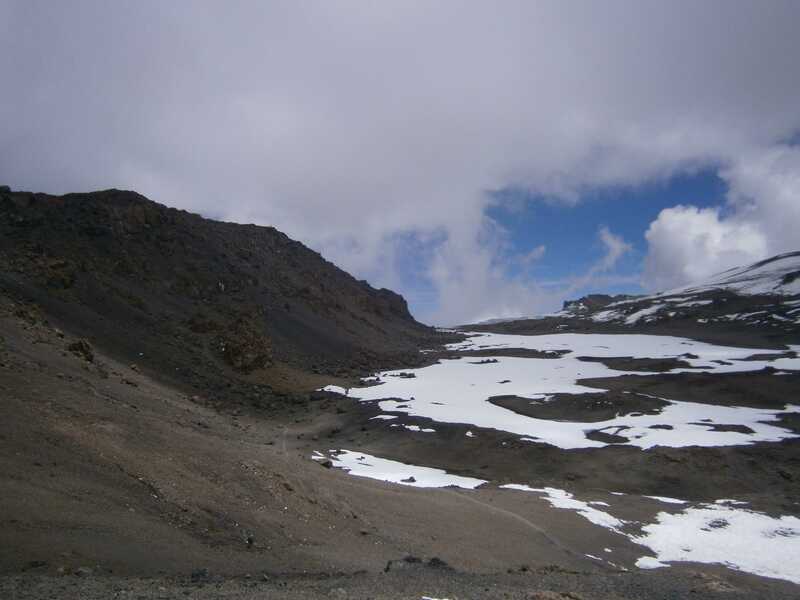 After pitching my camp and unloading gear, I began my final acclimatization hike. 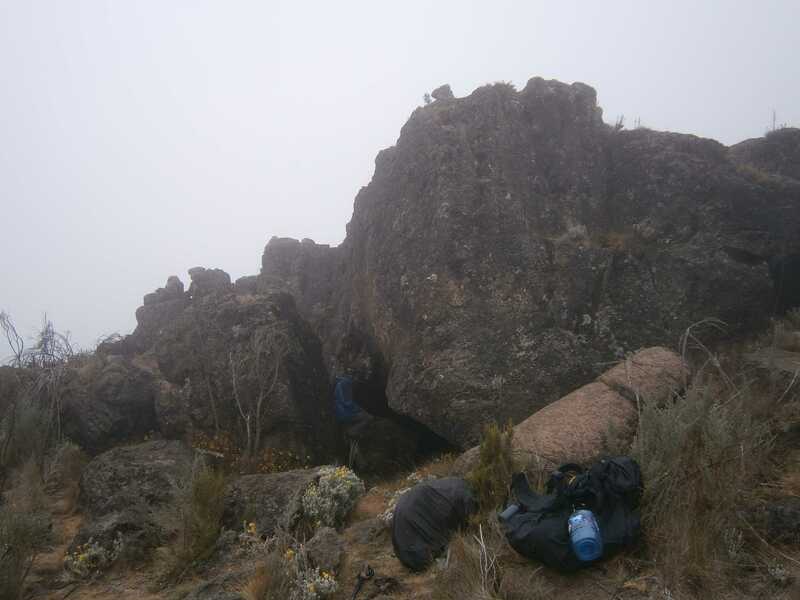 I followed the summit-trail up to Hans Meyer Cave at 5243m, where I rested for an hour before heading down to my campsite to cook an extra-large dinner, hydrate, and sleep. 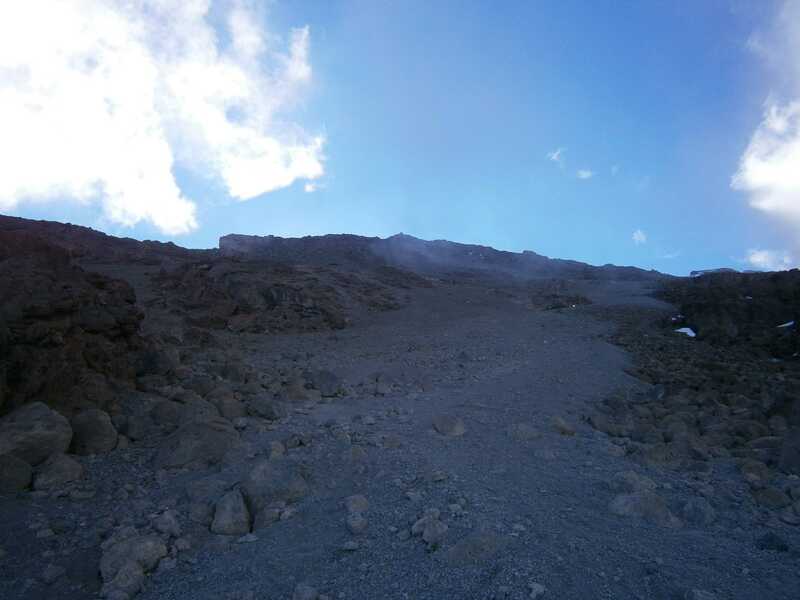 The summit trail followed a face of somewhat steep loose scree. The summit trail. Steep, loose scree all the way to Gillman’s point, roughly 950m of gain. Resting at Hans Meyer cave, 5243m. As I prepared to go to bed, the sunset created a beautiful glow behind Mawenzi, highlighting a nearly full moon. 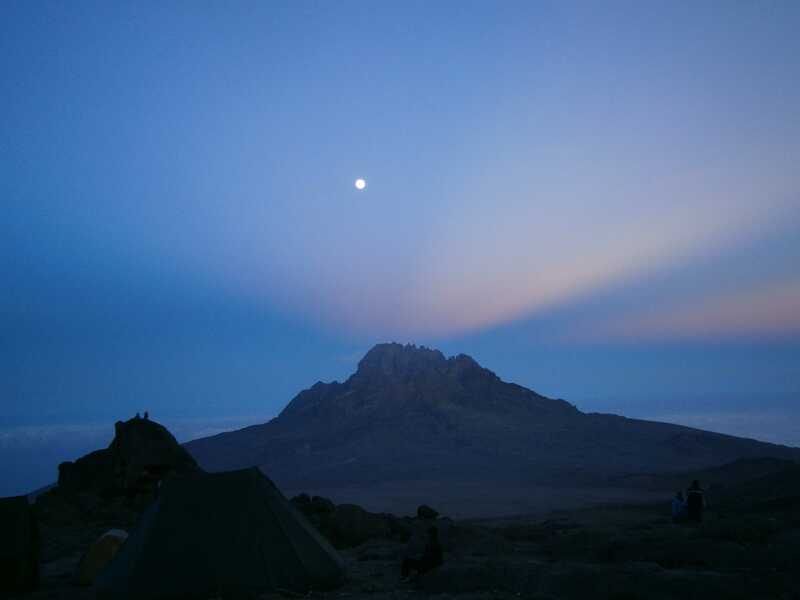 Mawenzi from Kibo Hut, at sunset. Day 5: Summit day. 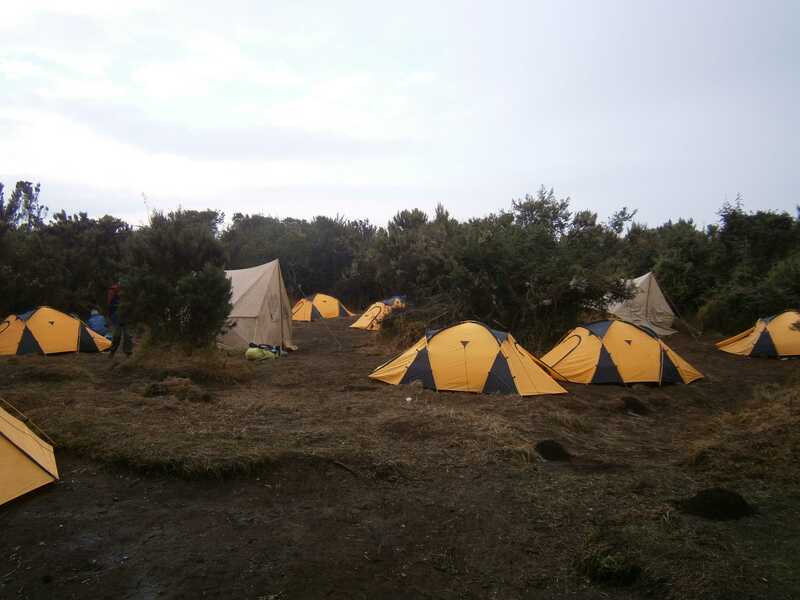 Most who climb Kilimanjaro opt to begin hiking to the summit around midnight, climbing overnight and reaching the top in the morning. I didn’t fancy the idea of sharing the scree-covered trail with a large crowd, and was also keen to avoid the darkness and cold of nighttime. Pace hadn’t been a problem to this point, so time wasn’t a big concern. With all of this in mind, I made it my plan to climb to the top during the day. This turned out to be an excellent decision. I woke up at 6 a.m., spent an hour boiling a liter of water (more problems with the stove), ate a fast breakfast, and started up the summit trail at 7:20 a.m. On the way up, I encountered large groups of other hikers coming down. 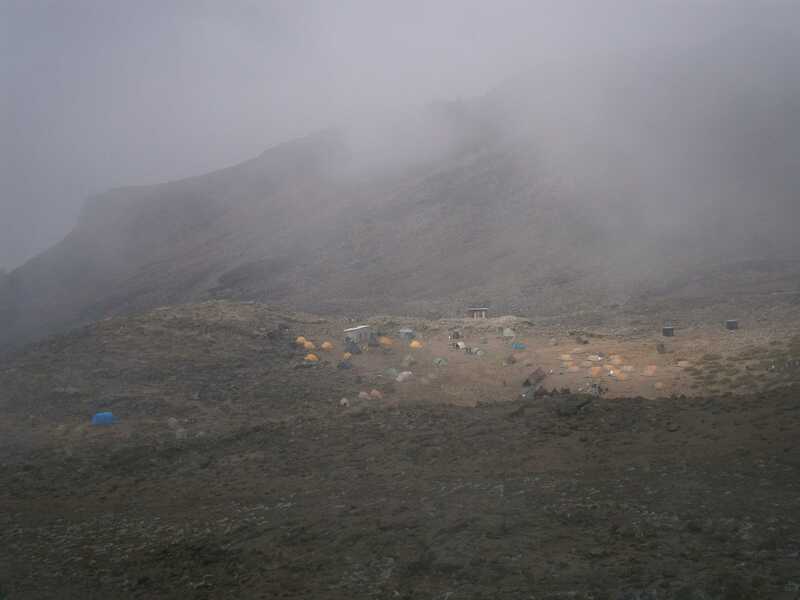 Quite a few were in poor condition, suffering from severe altitude sickness, and several were unable to walk unassisted. Many other hikers were descending, as I headed up. 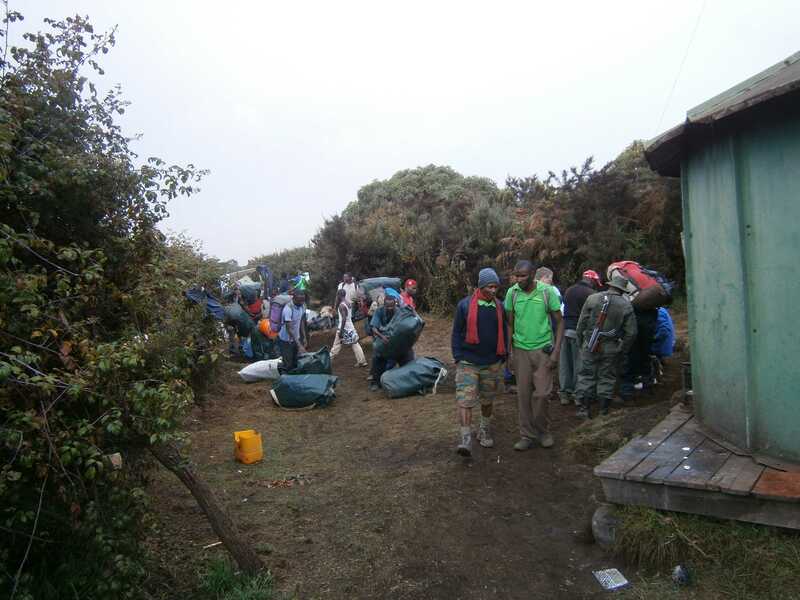 I encountered quite a few porters and guides assisting the descent of climbers suffering from altitude sickness. I wondered why their clients had been pushed to continue. 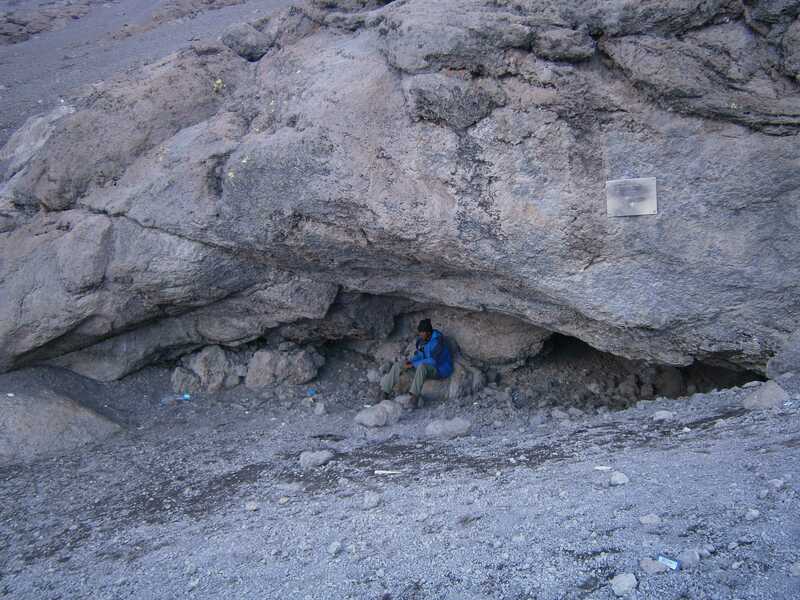 I reached 5243m Hans Meyer cave at 9:00 a.m., about 30 minutes faster than I had managed during the prior day’s acclimatization push. 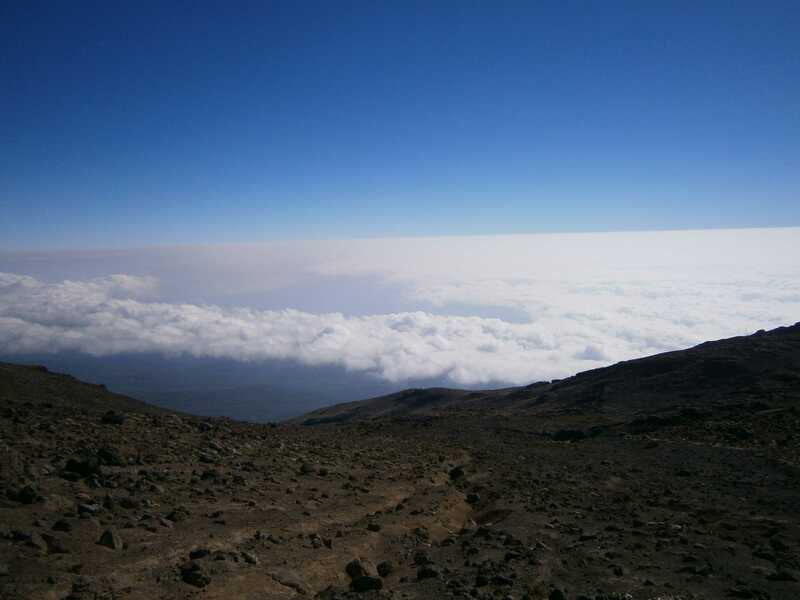 Mawenzi loomed on the horizon, a brilliant and seemingly endless cloud ocean behind it. 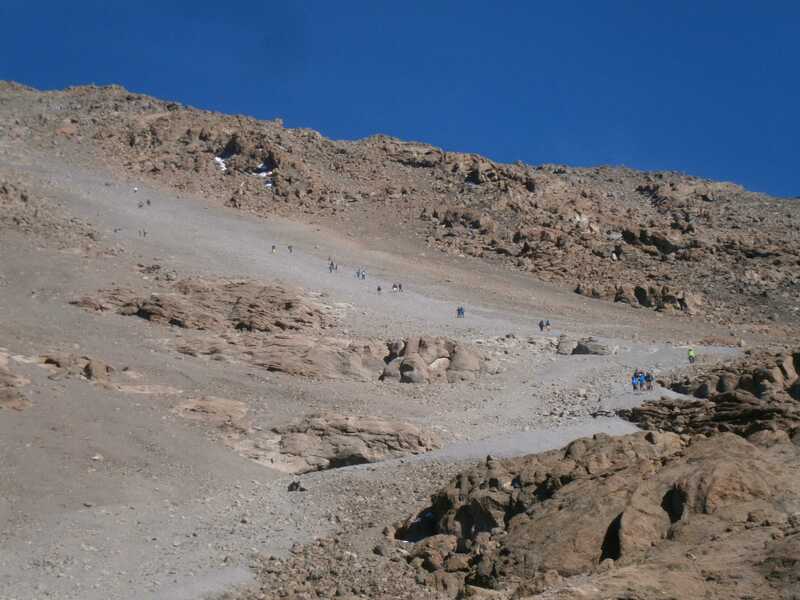 Up the scree slope, I could see the rocky outcrop which marks Gilman’s point, the end of the scree and the beginning of Kibo’s crater ridge. Mawenzi on the horizon, a huge cloud ocean behind it. Gilman’s point, the rocky outcropping in the middle of the picture. 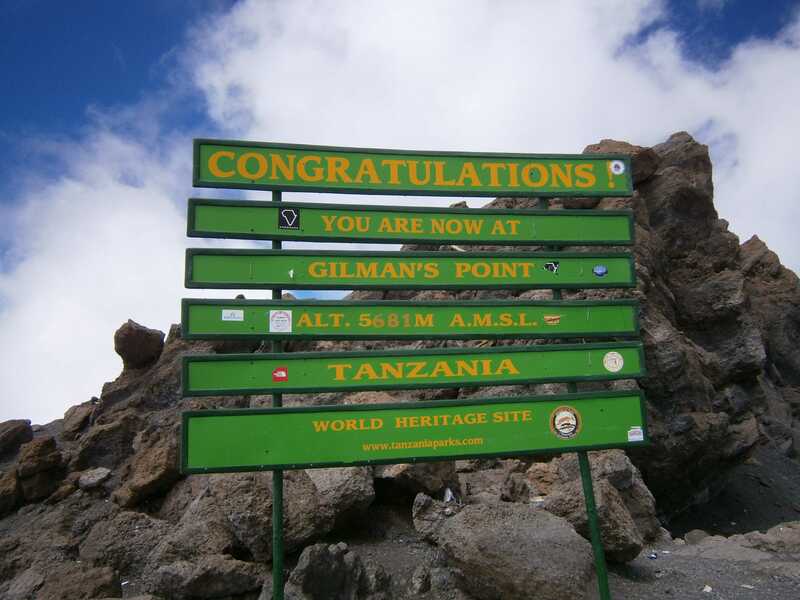 I reached 5681m Gilman’s Point at 10:45 a.m. 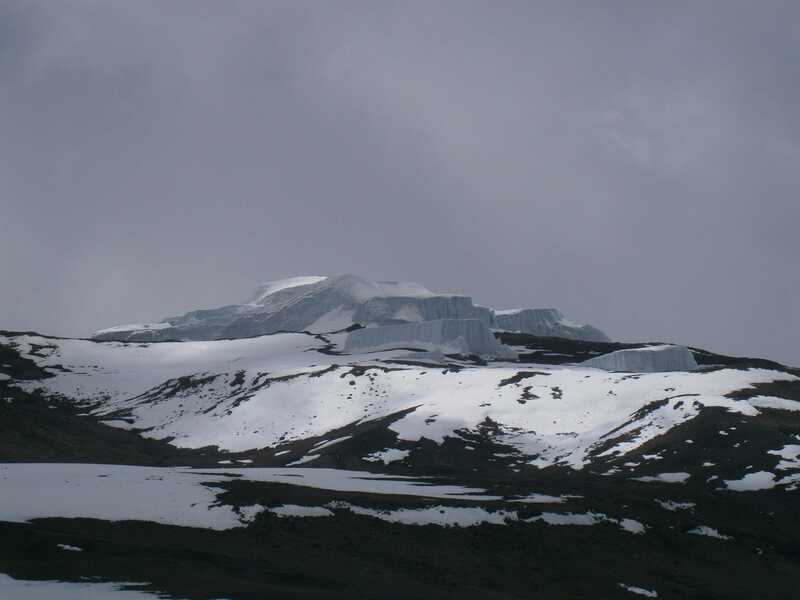 Here, I had my first glimpse of Kilimanjaro’s famous glaciers. A large sign marks Gilman’s Point. Distant glaciers were visible from Gilman’s point. 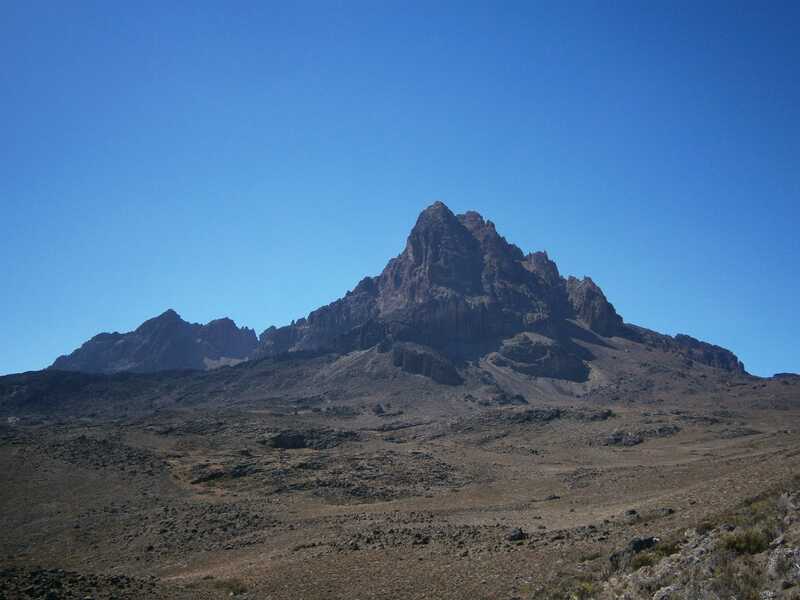 Further along, Uhuru Peak was visible in the distance. At 11:20 a.m. 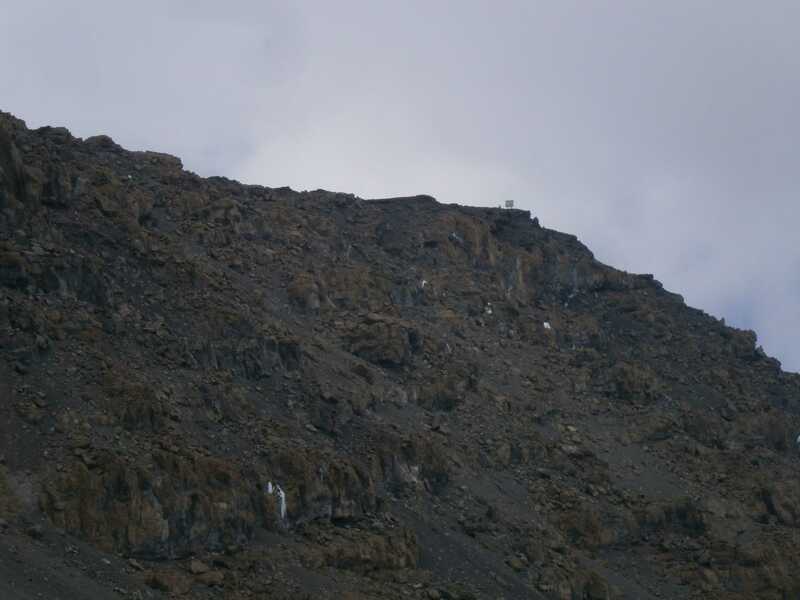 I reached 5739m Stella Point, roughly one hour away from the summit. 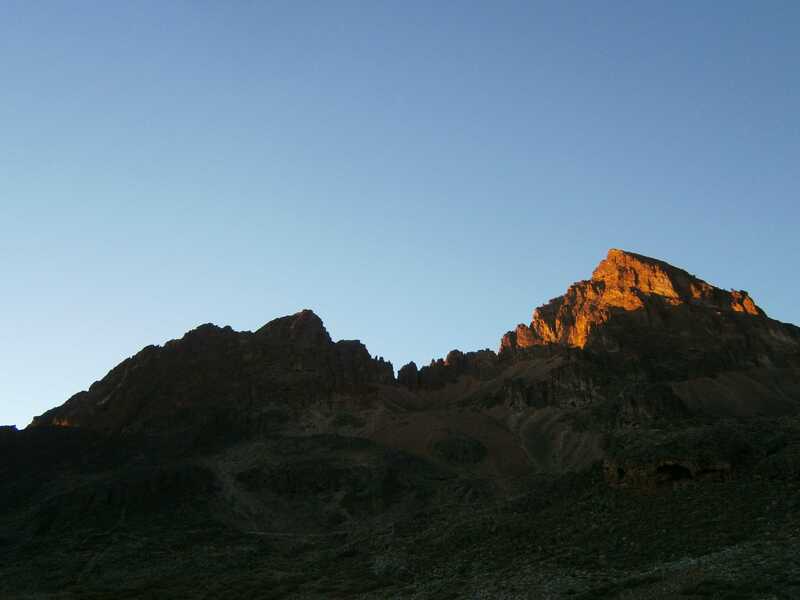 Uhuru Peak in the distance (center). Another large sign at Stella Point. 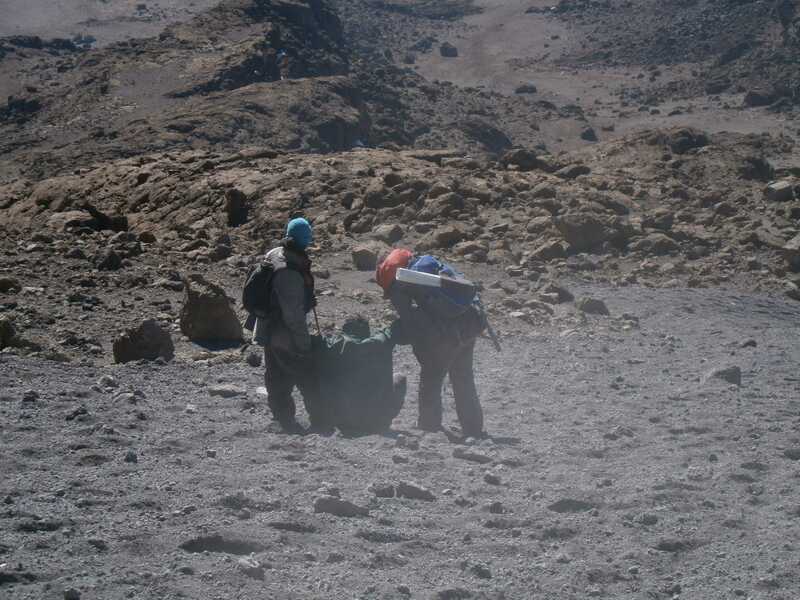 The landscape inside Kibo’s crater rim was barren and devoid of life. 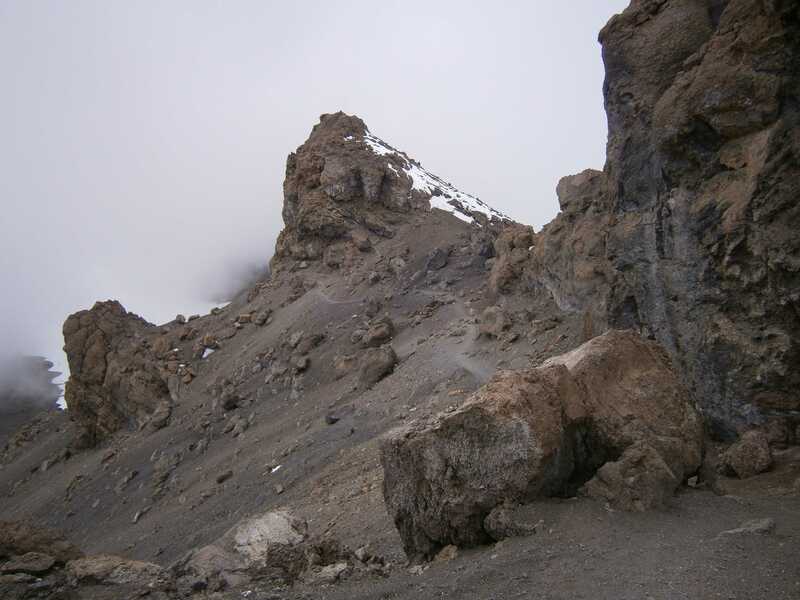 The path followed the rocky crater ridge, covered in volcanic scree and snow. 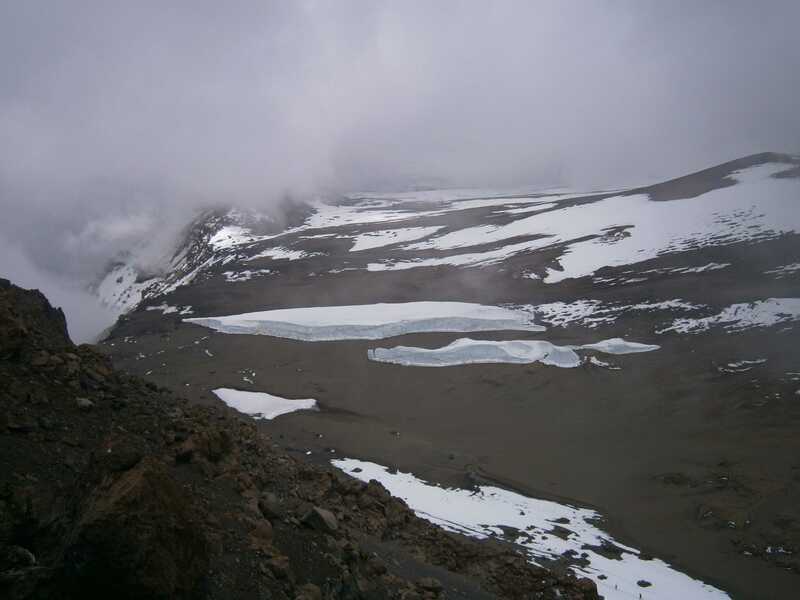 Alpine desert, inside Kibo’s crater. The path past Stella Point, heading towards the summit. 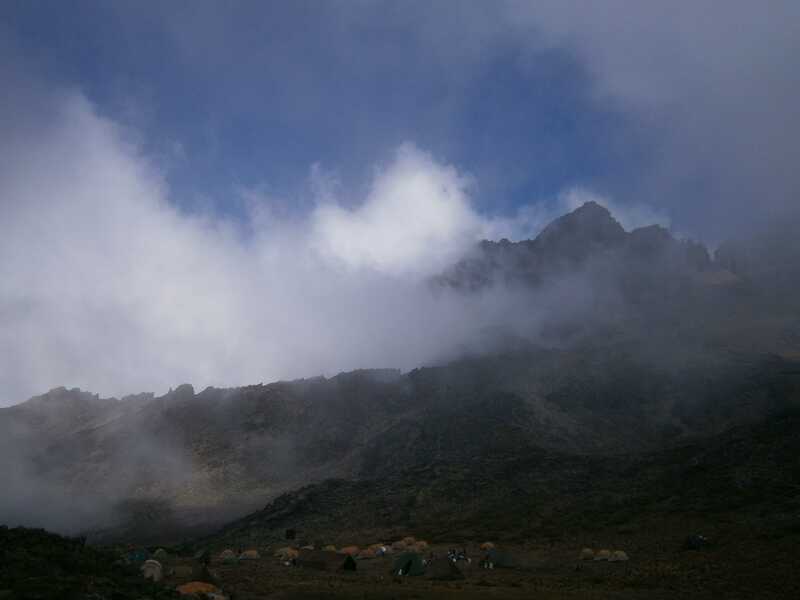 As clouds billowed past, the famous sign which marks the true summit of Kibo, Uhuru Peak, became visible. 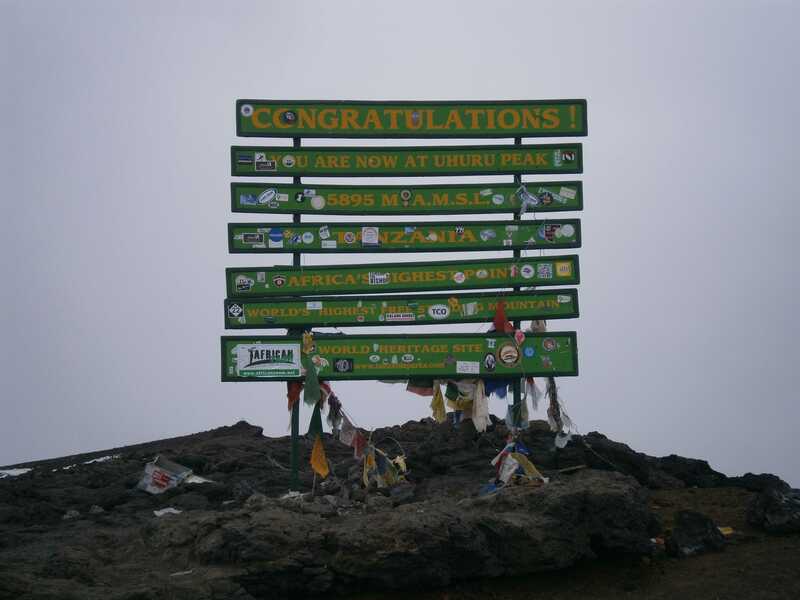 The summit sign finally appeared. 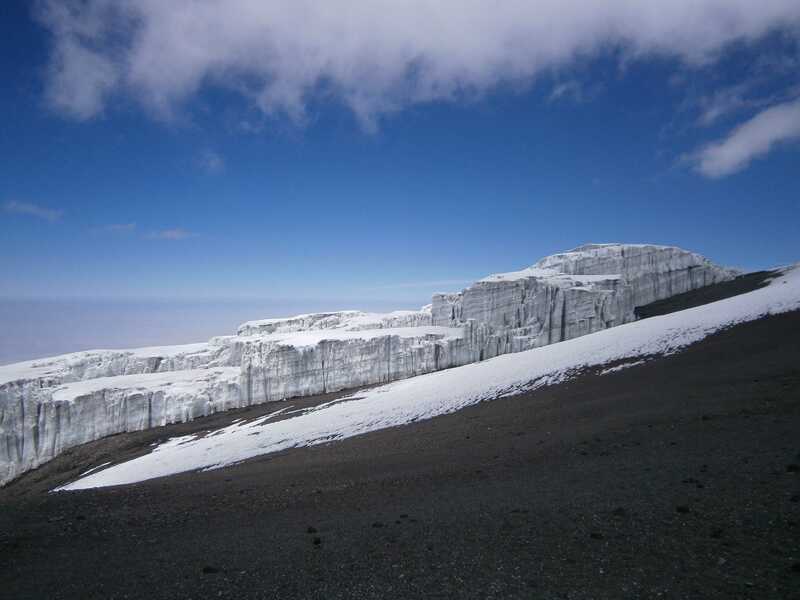 The glaciers on Kibo were impressive, but it was clear from their appearance that they had been receding. The glaciers were prominent near the top. It was incredible to see the size and height of the glaciers. 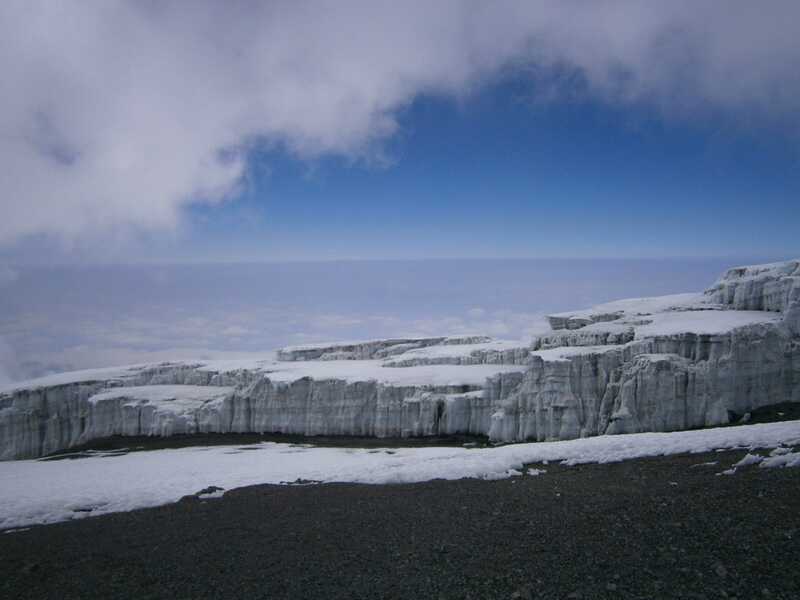 Bits of glacier inside of the crater ridge had almost melted completely. The cloud ocean seemed to stretch on forever. 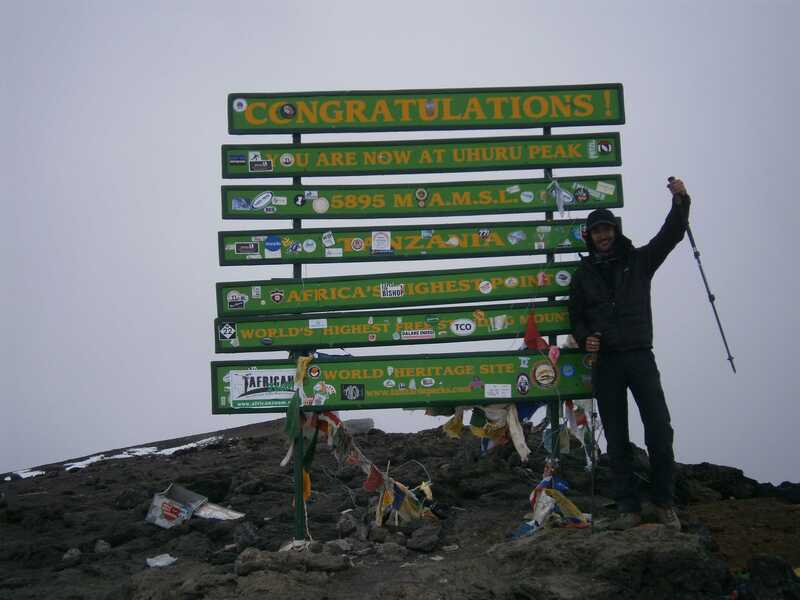 Stopping often to absorb the scenery and take lots of photographs, I arrived at 5895m Uhuru peak, the highest point in Africa, at 12:25 p.m. I spent around 25 minutes on the summit before heading back down. 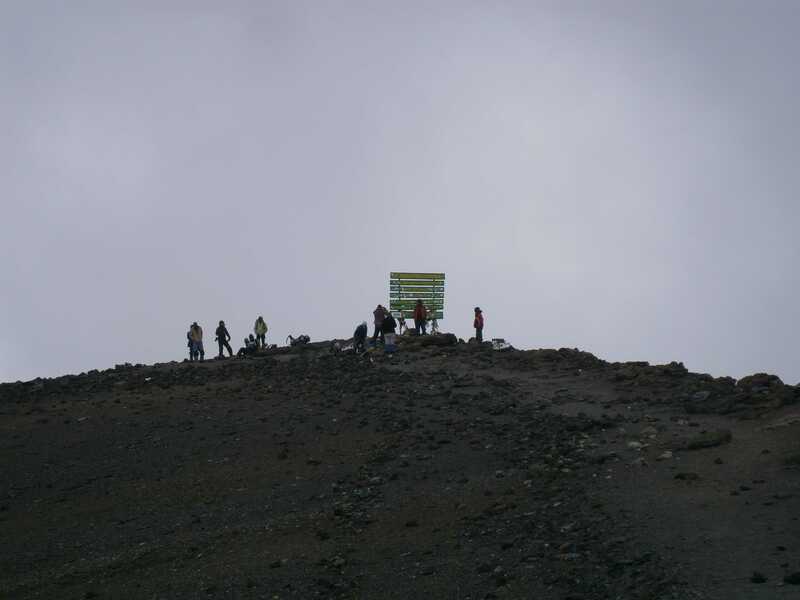 The final leg to the summit, where a small group was taking photographs and getting ready to descend. Feeling great at the top! Retracing my steps along the crater ridge trail. I arrived back at my campsite at 2:40 p.m., a 10.8km round trip. 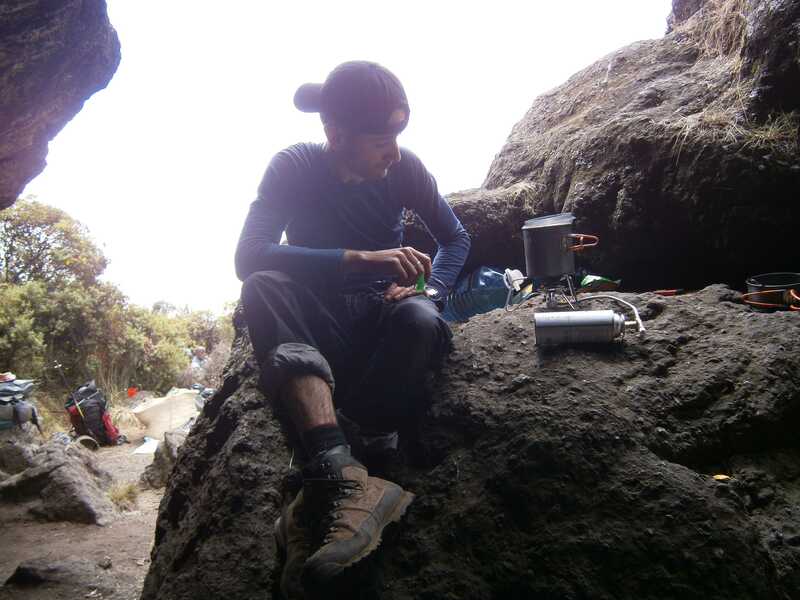 After cooking a quick meal, I packed up all of my gear, and began descending another 9.6km to the Horombo campsite. Packed up and ready to begin descending. 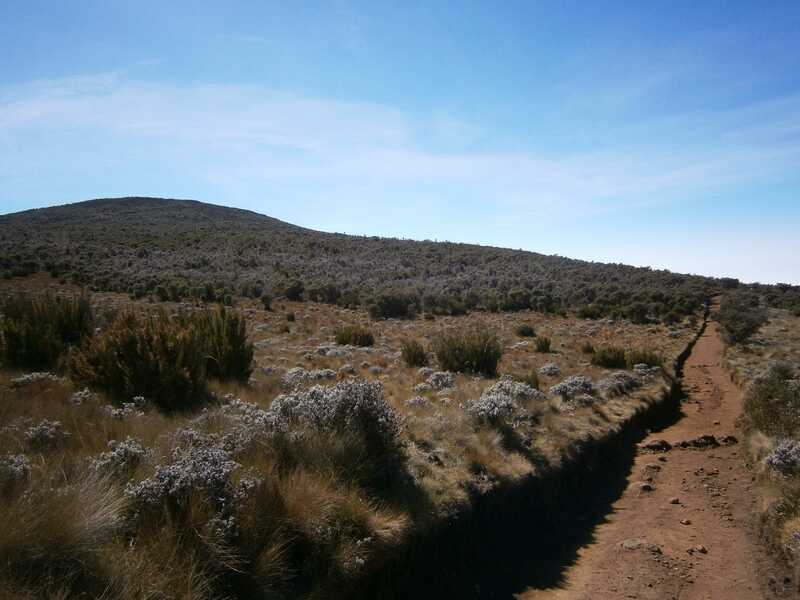 The route to Horombo was mostly level. 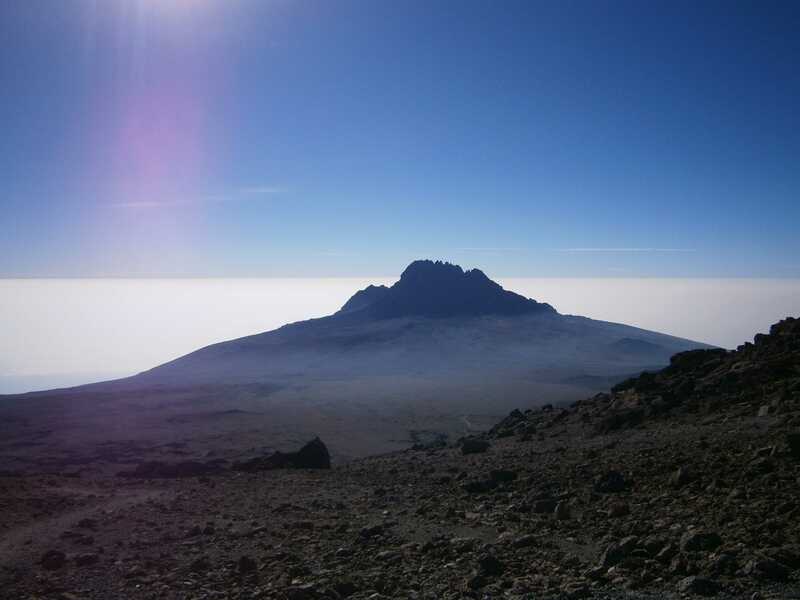 The Mawenzi/Kibo saddle is vast, dusty, and very flat. Mawenzi looked much different from the east. 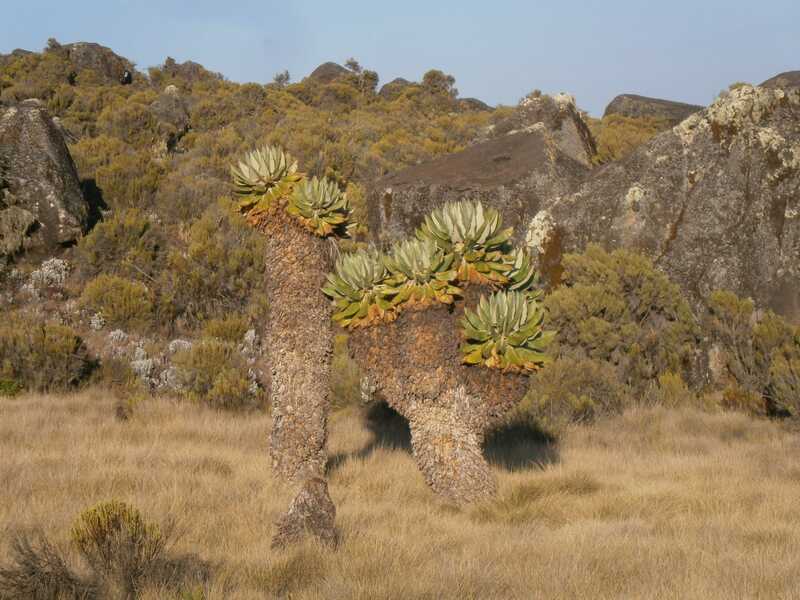 Many of these giant plants, Senecio Kilimanjari, were growing along this part of the route. The furry trunk of these plants is covered in their dead leaves. These apparently help insulate from the cold. 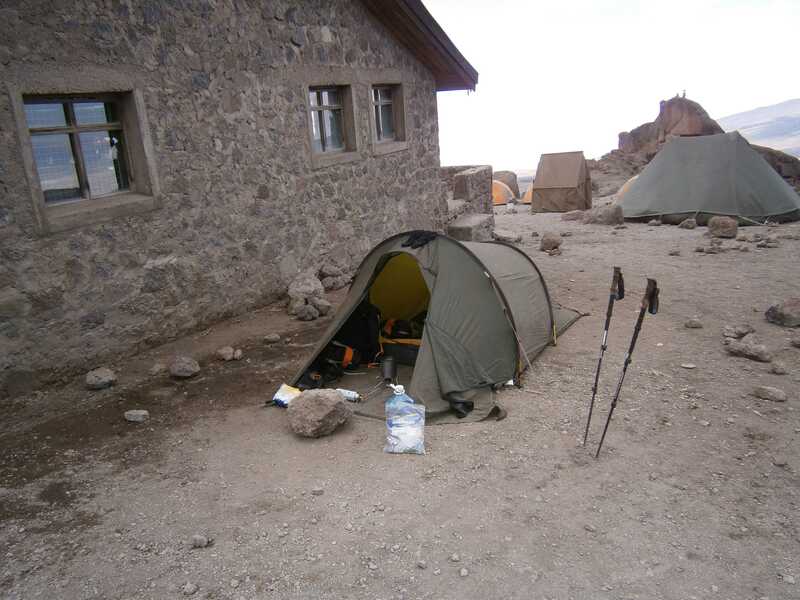 Horombo, my sixth campsite at 3720m, was more like a small village than a campground. Numerous huts housed hikers and their support staff, and there was even running tap water! 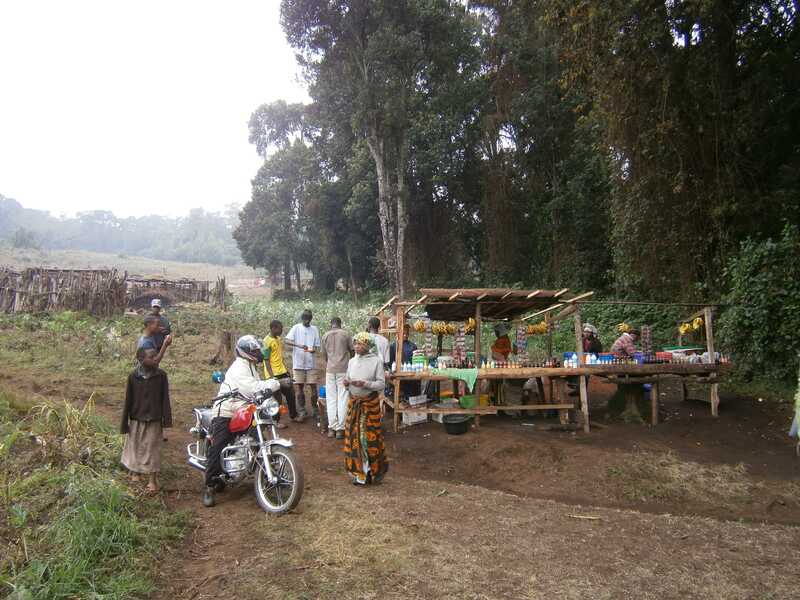 Approaching Horombo, where huts have capacity to accommodate a large number of people. Day 6: I slept in until 7 a.m., cooked a big breakfast, and prepared to leave the mountain. 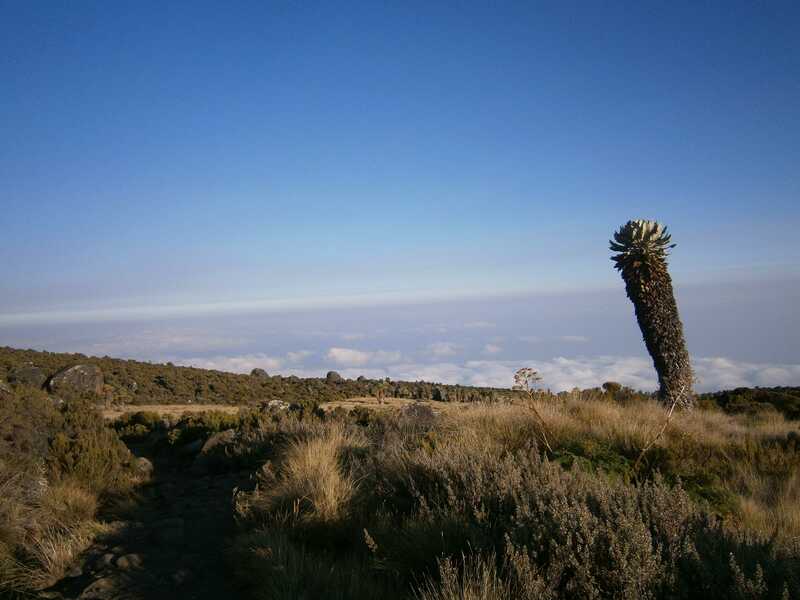 My final day, I descended from 3720m Horombo down to the Marangu Gate trailhead at 1800m. 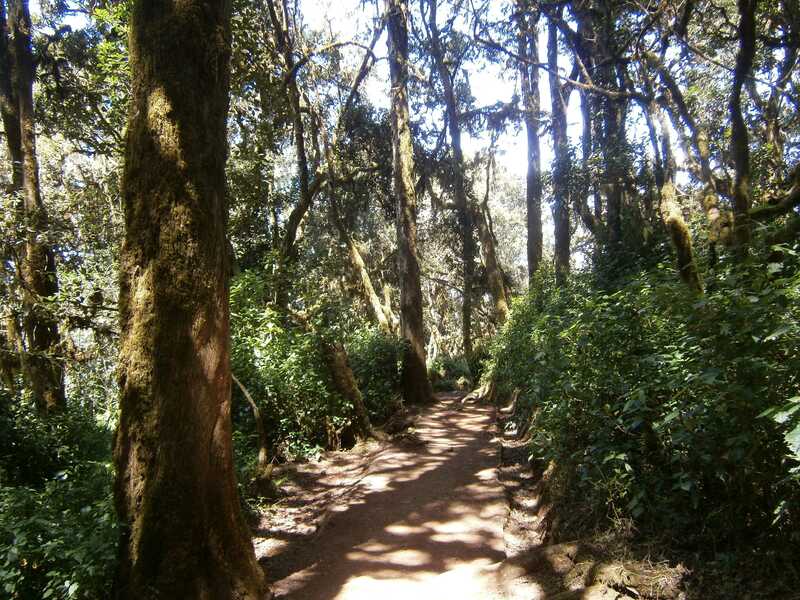 The trail down from Horombo was wide, and very gently sloped, so despite the substantial elevation loss the descent wasn’t too strenuous. The morning view from Horombo. An abundance of interesting vegetation covered this side of the mountain. 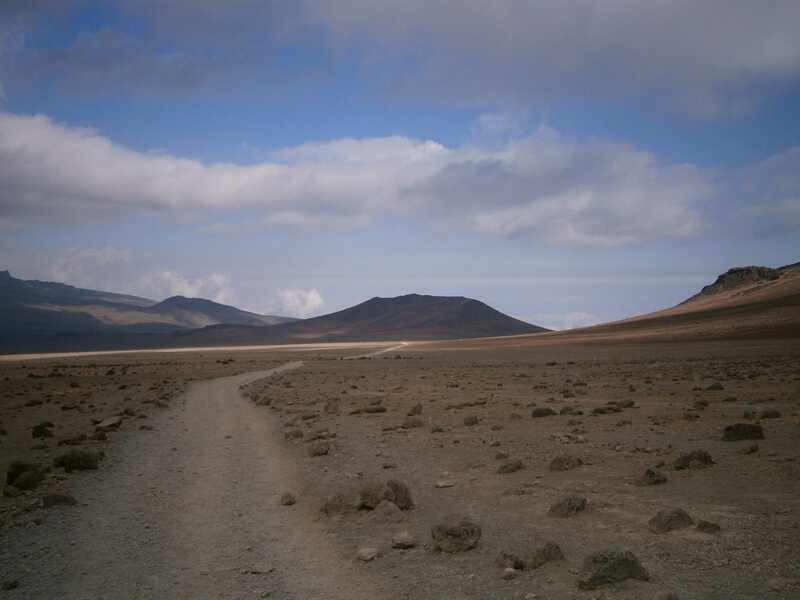 The trail from Horombo was wide and level. 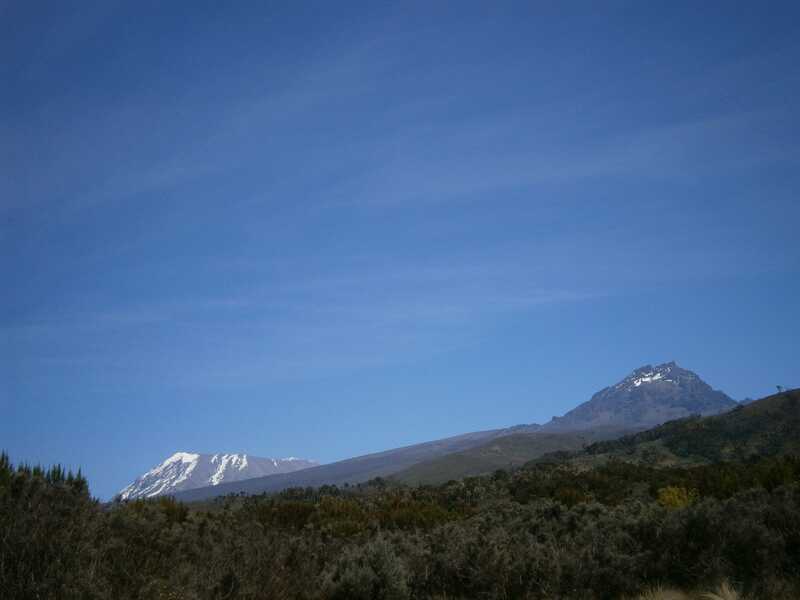 From the east, Kibo and Mawenzi were visible together. 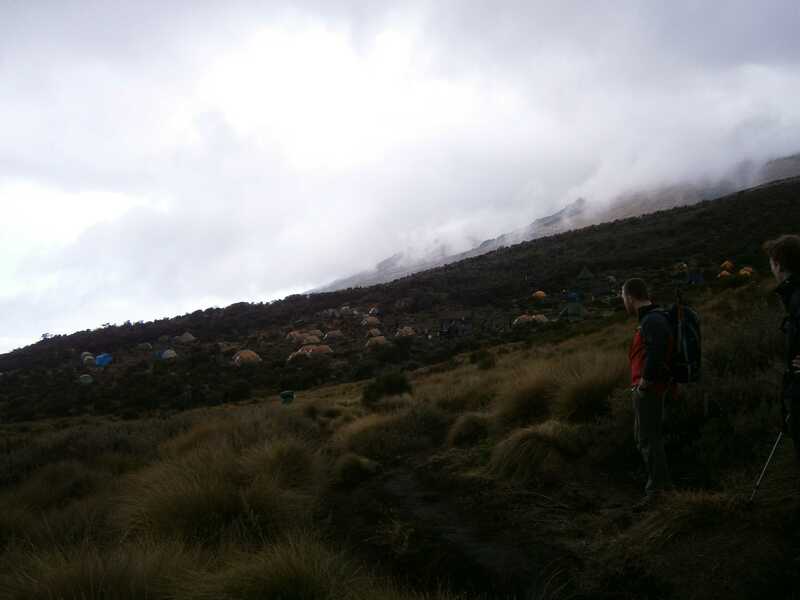 At 2700m I passed Mandara, another campground with an abundance of huts. As I descended further the vegetation thickened, and the path passed through forest. 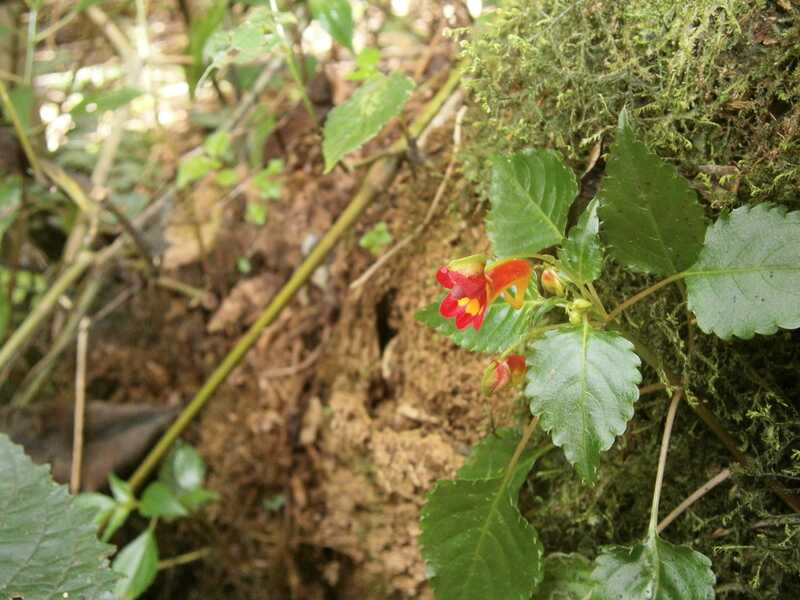 Many of these small, bright ‘elephant’s trunk’ flowers grew everywhere. 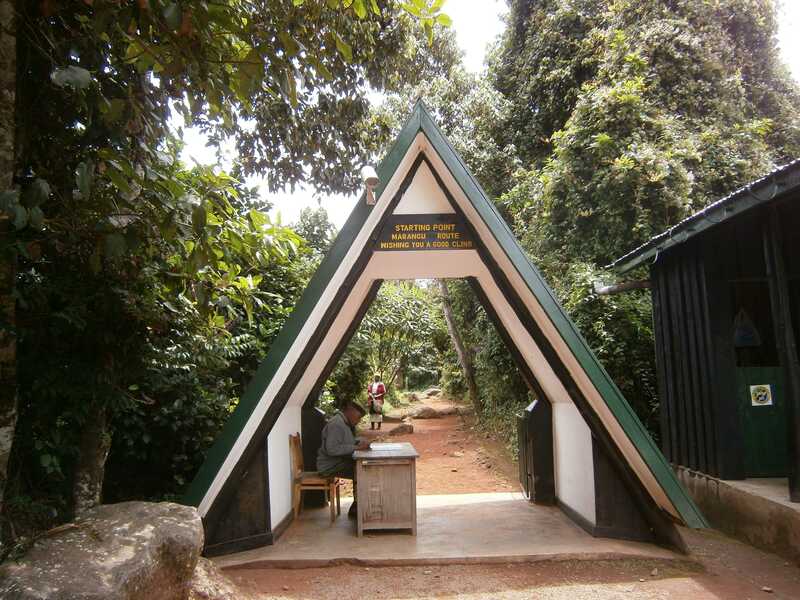 Finally I reached the Marangu Gate, my exit point and the starting point for hikers taking the Marangu route up the mountain. At the Marangu Gate I checked out with the park rangers, weighed my pack at 17.5kg, and took a bit of time to look at some interesting commemorative plaques, maps, and signs near the gate. After six days on the mountain, it was a little bit peculiar how quickly I found myself back in civilization after reaching the trailhead. Jackson and I met our driver, had a huge lunch of cheeseburgers, salad, and cold beer, and drove back to Arusha. 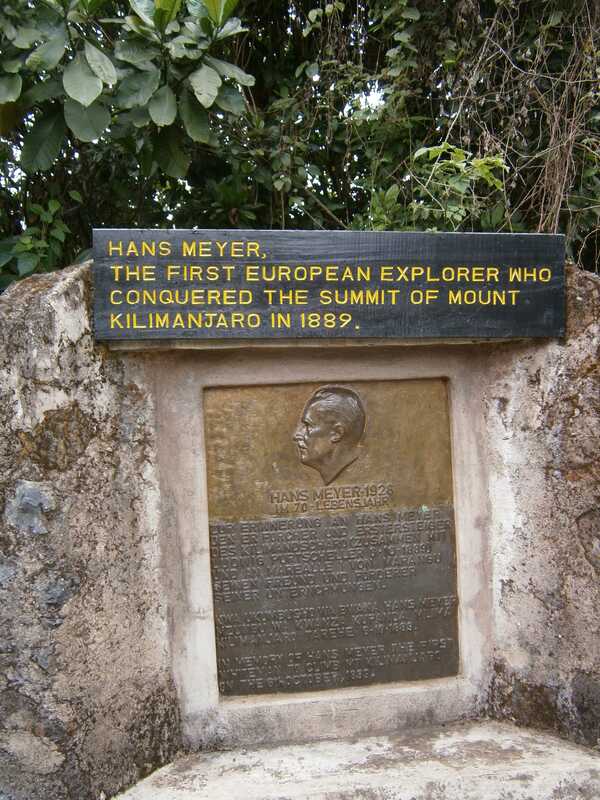 A plaque at Marangu gate, commemorating Hans Meyer, the first European to climb Kilimanjaro. Another plaque, dedicated to Hans Meyer’s climbing team. 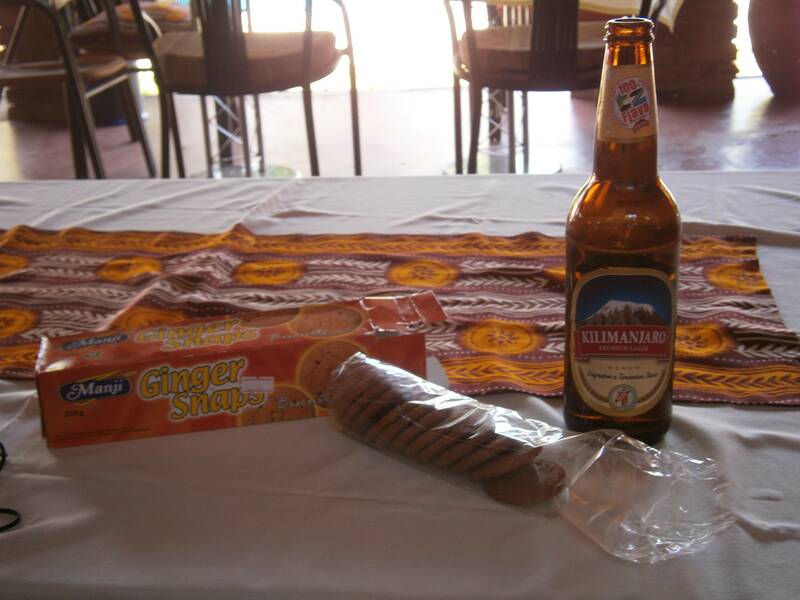 Kilimanjaro beer and ginger cookies back at my hotel. In all, the climb went almost perfectly as planned. 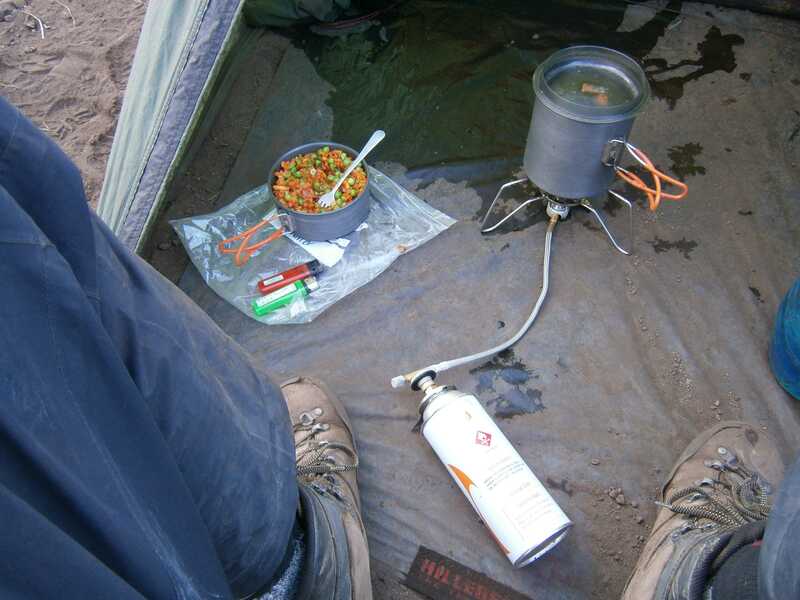 Aside from persistent – but manageable – issues with my stove, everything went smoothly and was enjoyable. I was lucky with weather, and mostly had clear days. Climbing to the summit during the day was excellent; it afforded great views and allowed me to avoid the crowds and cold. Above ~5000m the altitude made physical output more challenging, but I didn’t have any issues with altitude sickness or related discomfort. 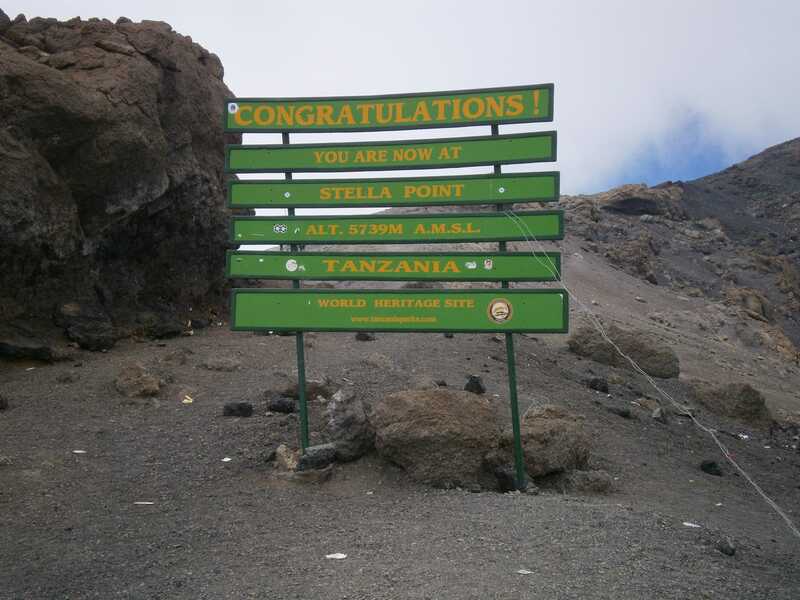 My acclimatization definitely benefited from spending three days hiking Mount Meru before beginning Kilimanjaro, and I feel that the geography of my route also helped a great deal. I was surprised at the crowds on the mountain, and a little bit disappointed by the amount of garbage I saw, especially near the top, left behind by other hikers. Doing the climb unsupported kept my days busy setting up camp, cooking, obtaining water, and managing gear, which made for a rewarding hike! 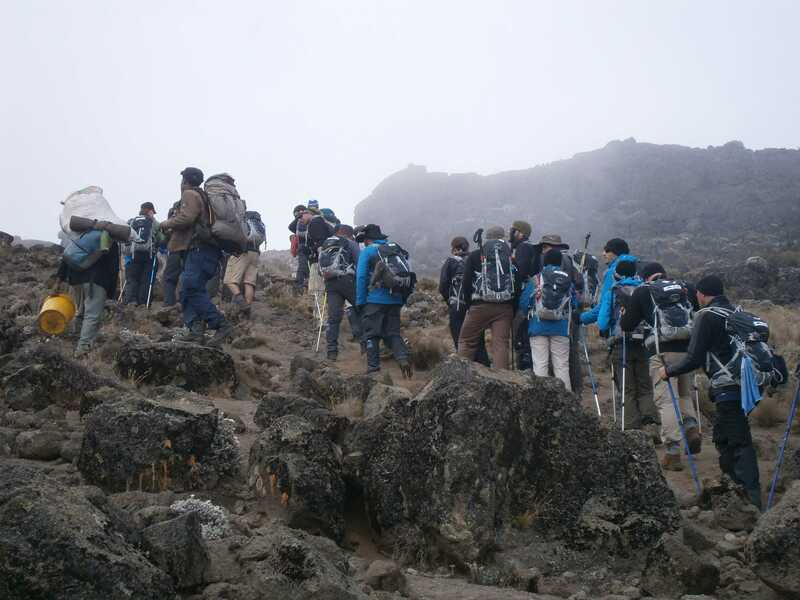 Kilimanjaro is highly accessible. Numerous guide and tour companies exist, and offer a wide variety of support options for hikers. Price varies dramatically, and largely depends on the level and quality of support provided. Most companies incorporate transportation, accommodation, and related logistics into their trip pricing. The Kilimanjaro Airport offers easy access into Arusha and Moshi. 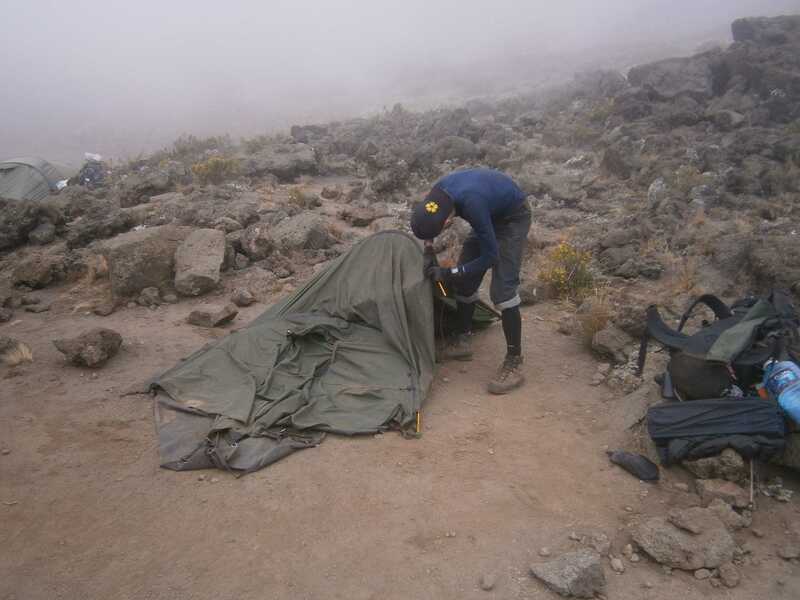 At minimum, a guide is required for climbing permits, and I hired mine through a no-frills outfitter called Kilimanjaro Alpine Service, who offer unsupported ‘superlight’ services (no porters, cooks, gear or food). I stayed at the Outpost Lodge in Arusha, which I found to be very comfortable and reasonably priced. 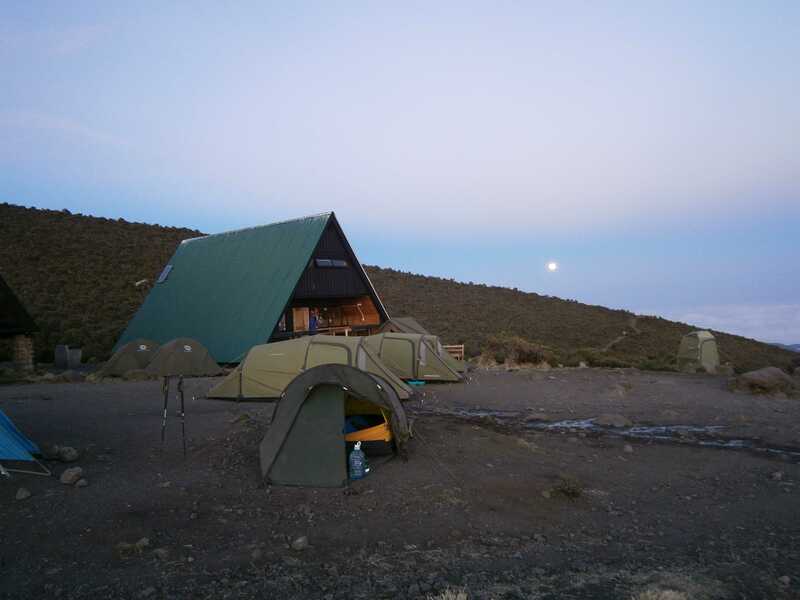 A wealth of information exists on hiking Kilimanjaro, and some outfitter websites also serve as quite detailed resources. 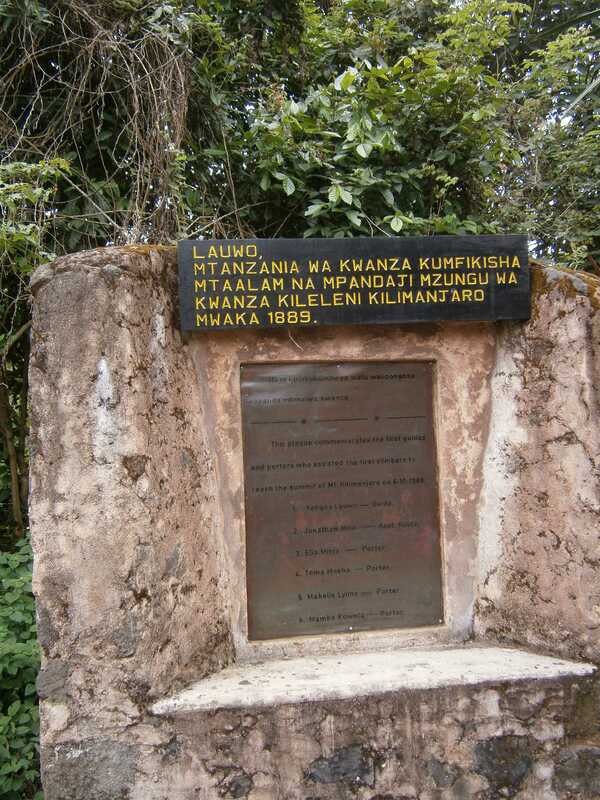 This entry was posted in Hiking, Tanzania and tagged Kibo, Kilimanjaro, Mawenzi, mount meru, Tanzania by Ian. Bookmark the permalink.